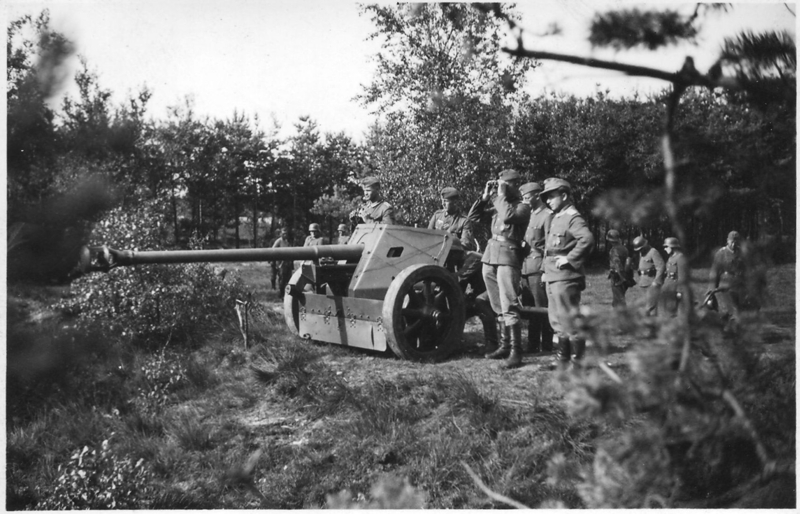 The standard anti-tank gun of German forces in World War II was the 7.5 cm PaK 40. Used throughout the war in every theater, the some 20,000 guns produced were the bane of every Allied tank. As the modern video below shows, the PaK 40 was fearsome weapon. After modelling so many German infantry figures over the past year, I very much wanted to mix things up. I picked up a deal on a few blister packs of 28mm Warlord Games Bolt Action metal miniatures at last year’s HMGS Fall In! 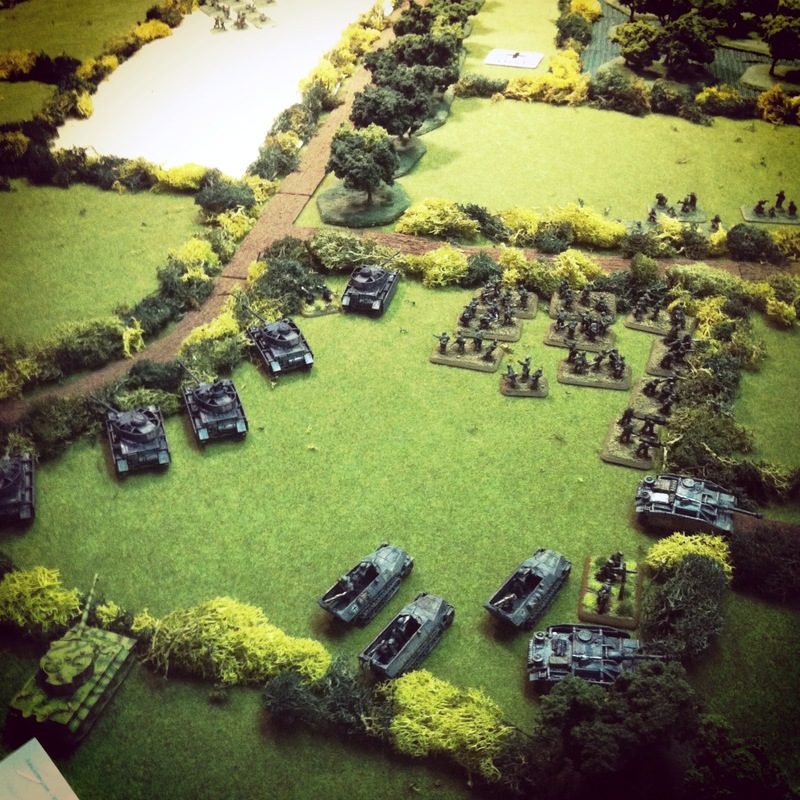 2015 convention, including a PaK 40, a forward observer team and a German high command set. As always, the 28mm metal models from Warlord go nicely with my other Germans in both scale and sculpting. 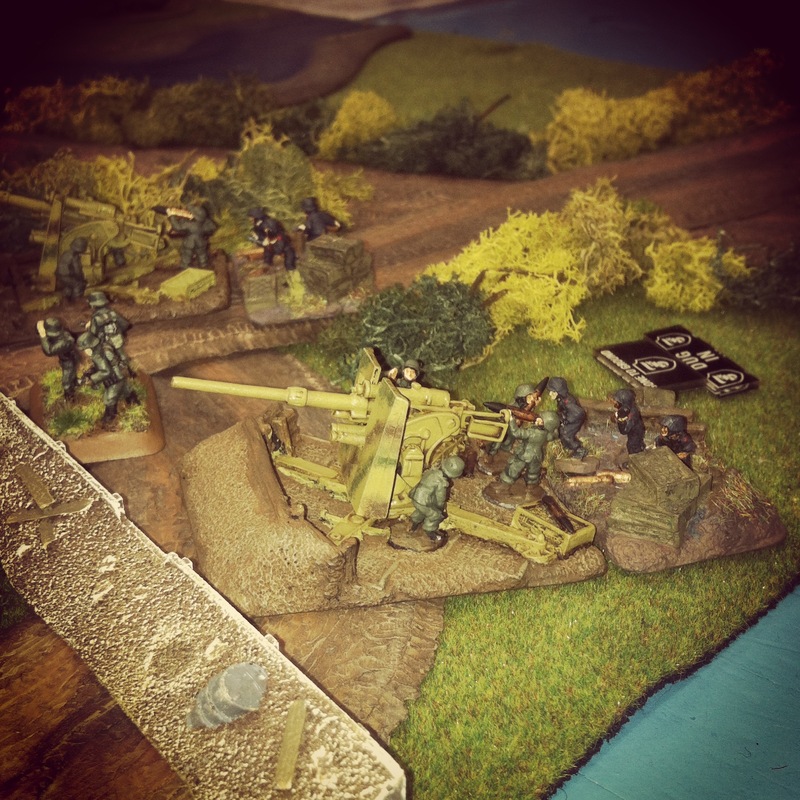 The artillery piece and the high command set both allowed me to create little tabletop battlefield vignettes while deployed with other individual models. My painting approach is pretty standard for my German forces. Individual figures get a little flash clean up before being glued to metal washers. The high command set went on a 60mm plastic base from Proxie Models. 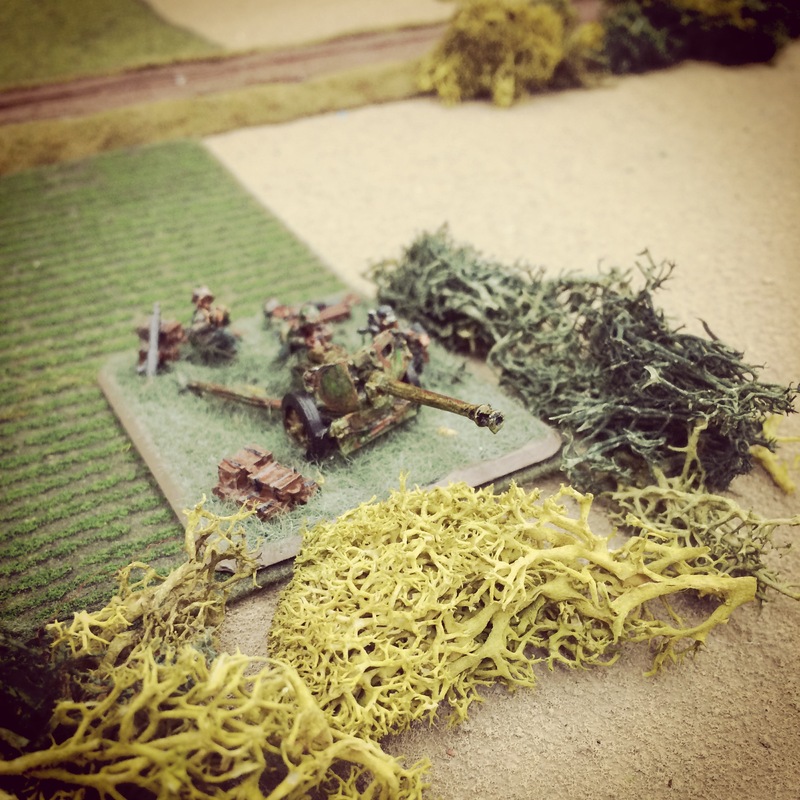 The PaK 40 and its crew went on two of the 60mm bases which I cut and glued together. From there, here were the steps in detail for painting my German infantry. Paint PaK 40 with Tallarn Sand. 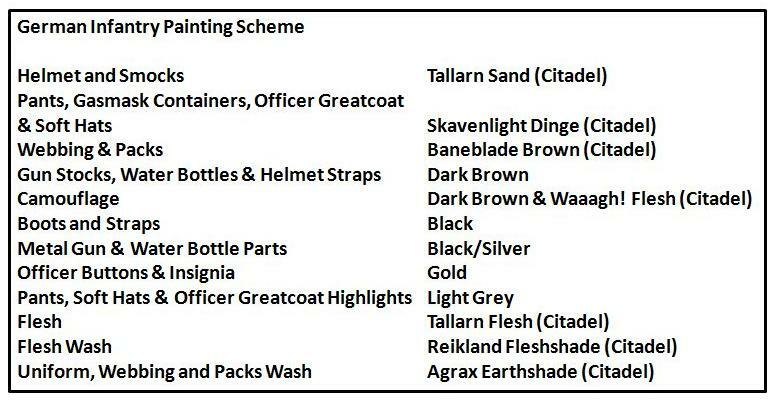 Paint pants, soft hats, officer uniforms and gas mask containers with Skavenlight Dinge. The high command table also gets painted Dark Brown followed by a a dry brushing of Baneblade Brown. The map on the table is painted in Off White with lines drawn on in varying colors with a very fine brush. And here’s the finished results. 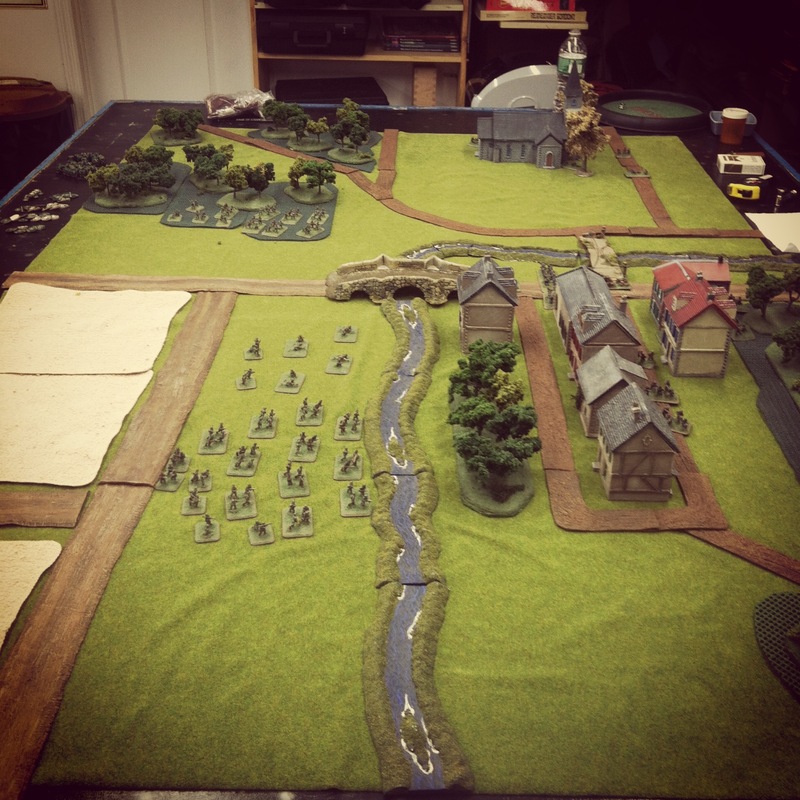 With a new Brooklyn Bolt Action group holding their first event this weekend at Nu Brand Gaming with some of us from Metropolitan Wargamers in attendance I can’t wait for some of my 28mm models to march into battle. 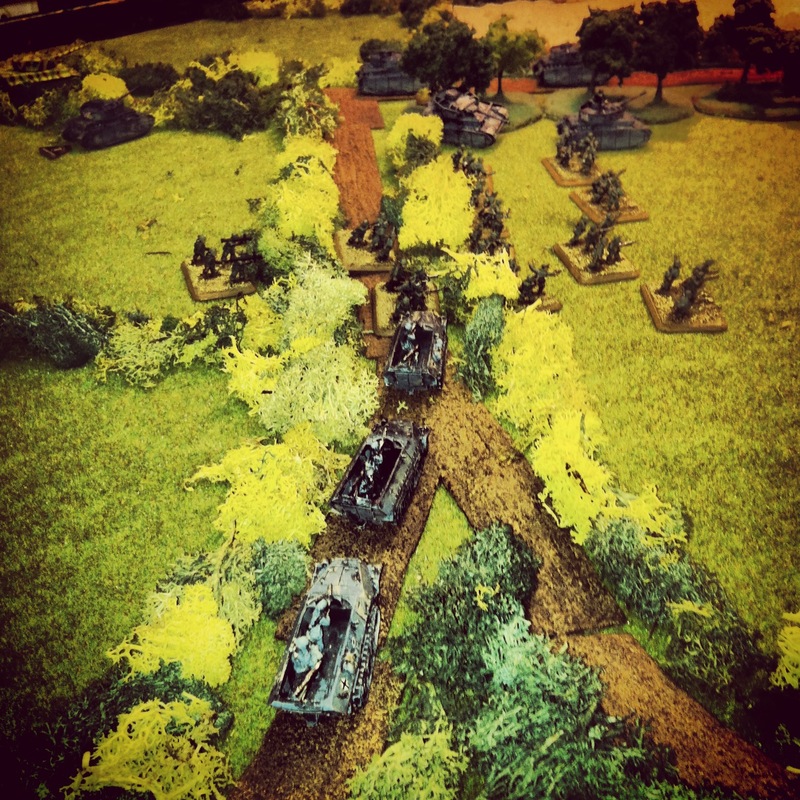 This past week, two of us at Metropolitan Wargamers in Brooklyn, NY headed back to the summer of 1943 and the opening days of what would become known as the Battle of Kursk. 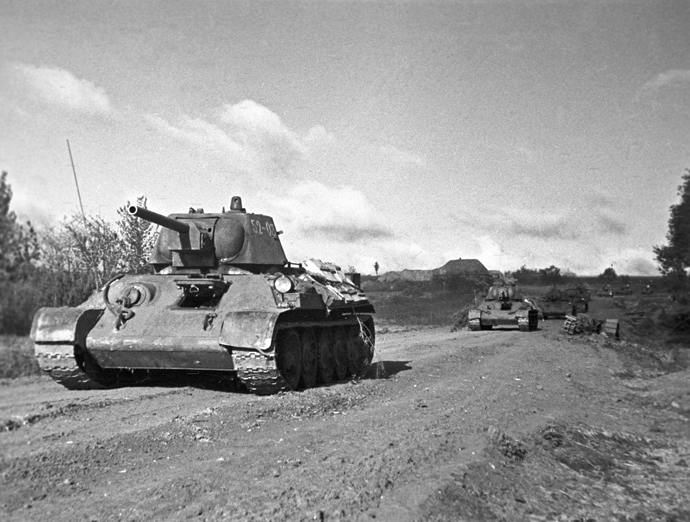 The German offensive in Soviet territory, known as “Operation Citadel,” took place southwest of Moscow and led to one of the largest tank battles of all time, the Battle of Prokhorovka. 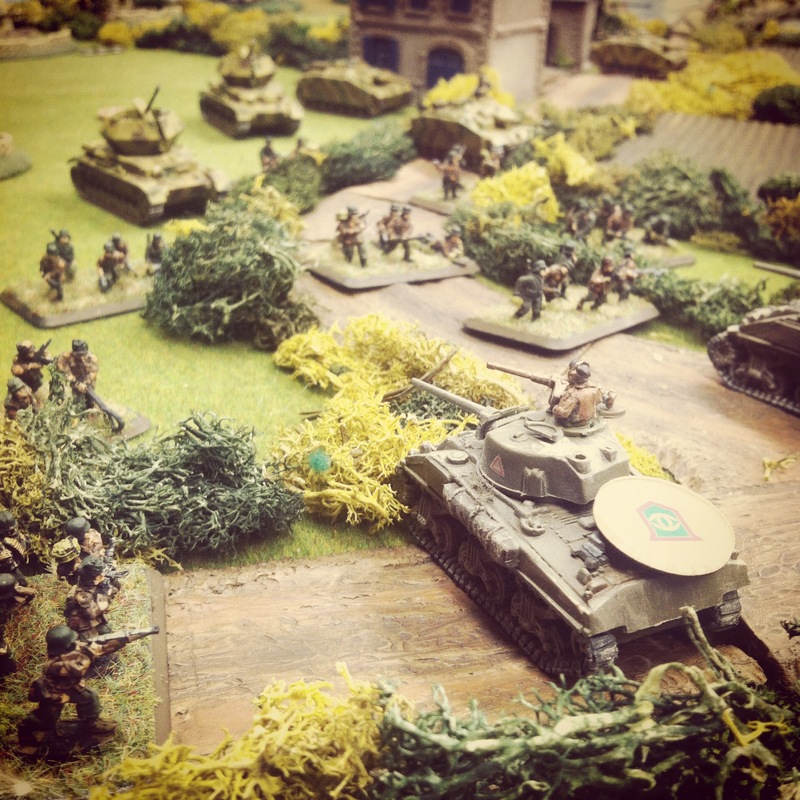 It was south of Prokhorovka at the Oktiabrski State Farm where our game began. 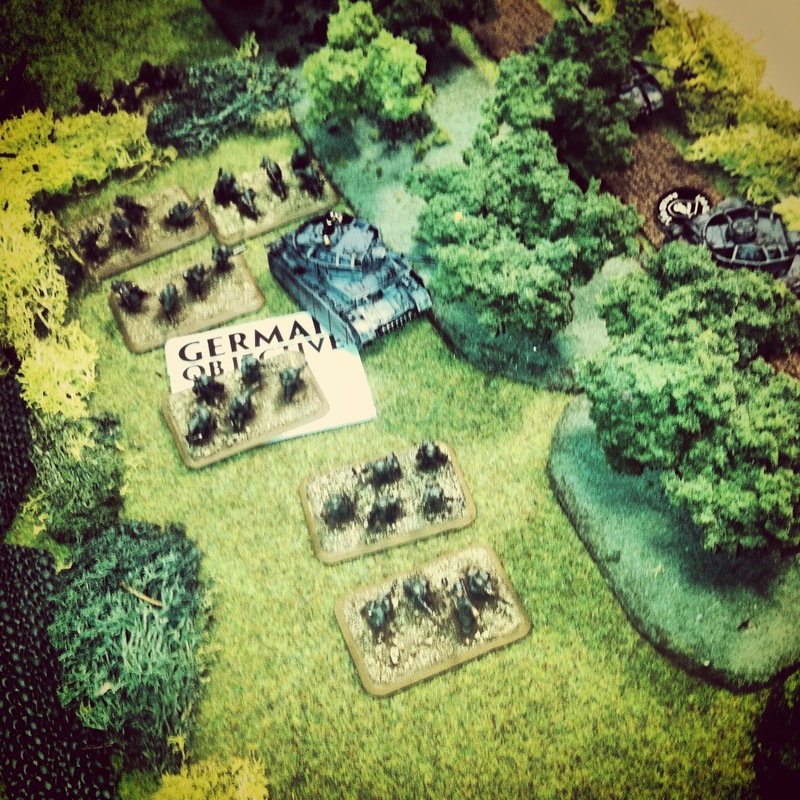 Our first Eastern Front and largest IABSM game to date started with the German infantry, Pak 40 anti-tank guns and two StuG III units deployed in hidden on a third of the table. 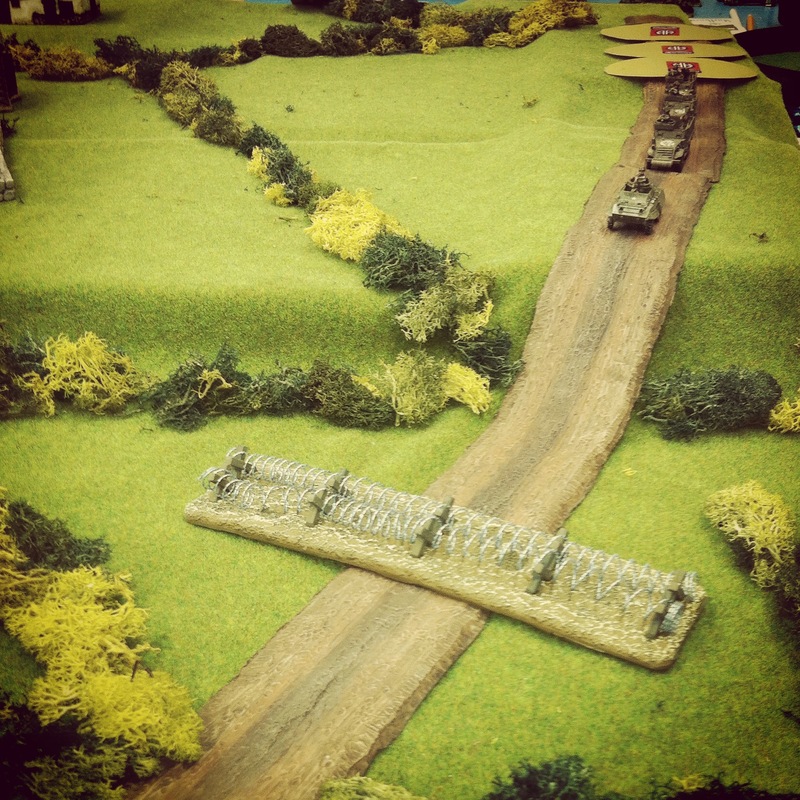 Across a wide field, the Soviets deployed on blinds along the table edge in and around a collective farm complex. 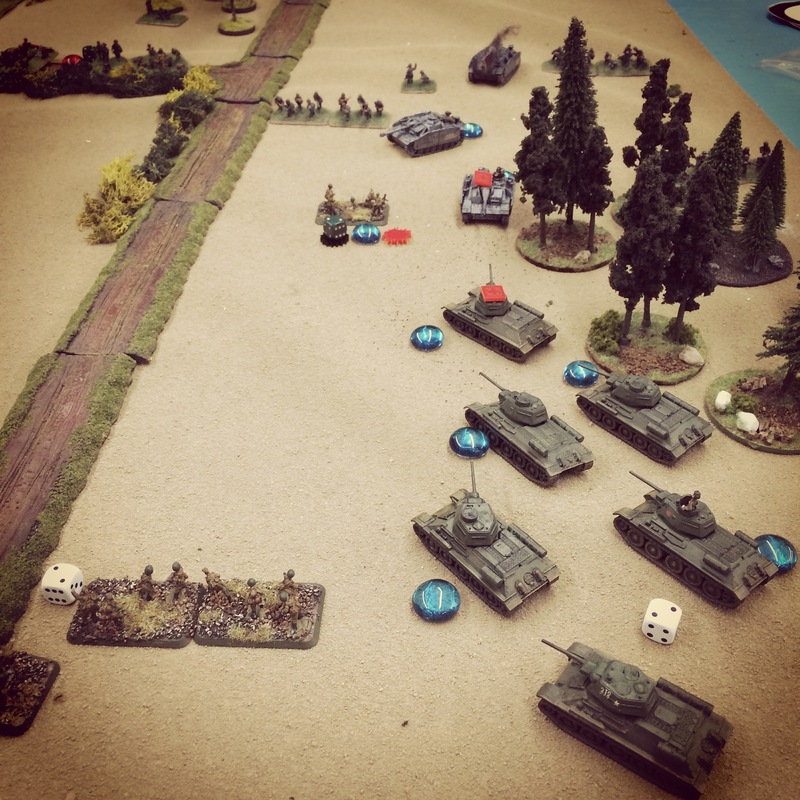 The initial Soviet blinds featured three infantry platoons at the center, a T-34 tank platoon to the left flank and one more tank platoon arriving on blinds in the second and third turns. 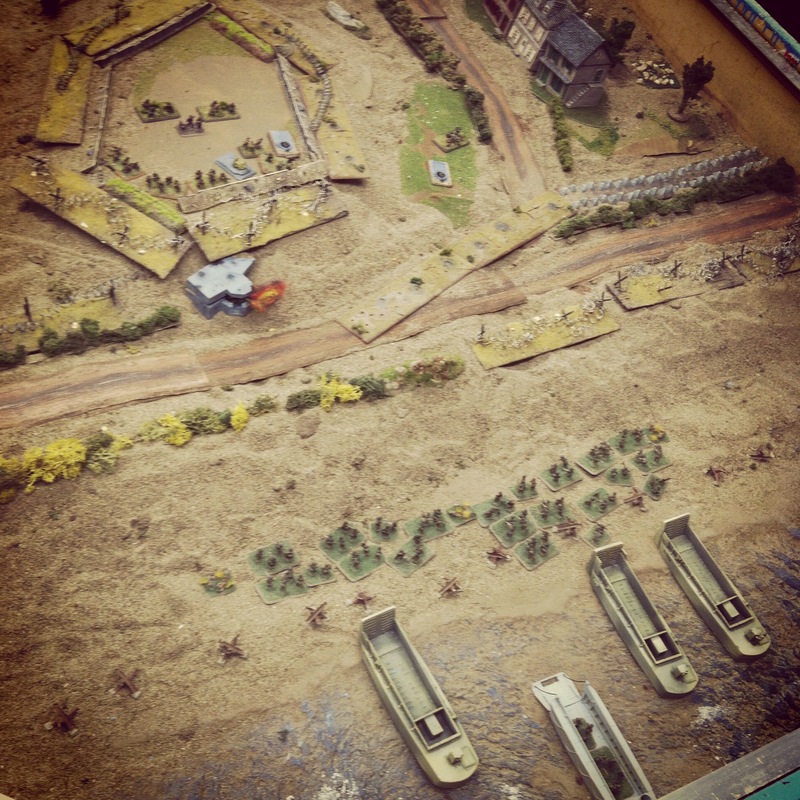 Each side also featured off board artillery and the German side also had air fire to draw on throughout the game, although none of it would play a measurable role during the battle. 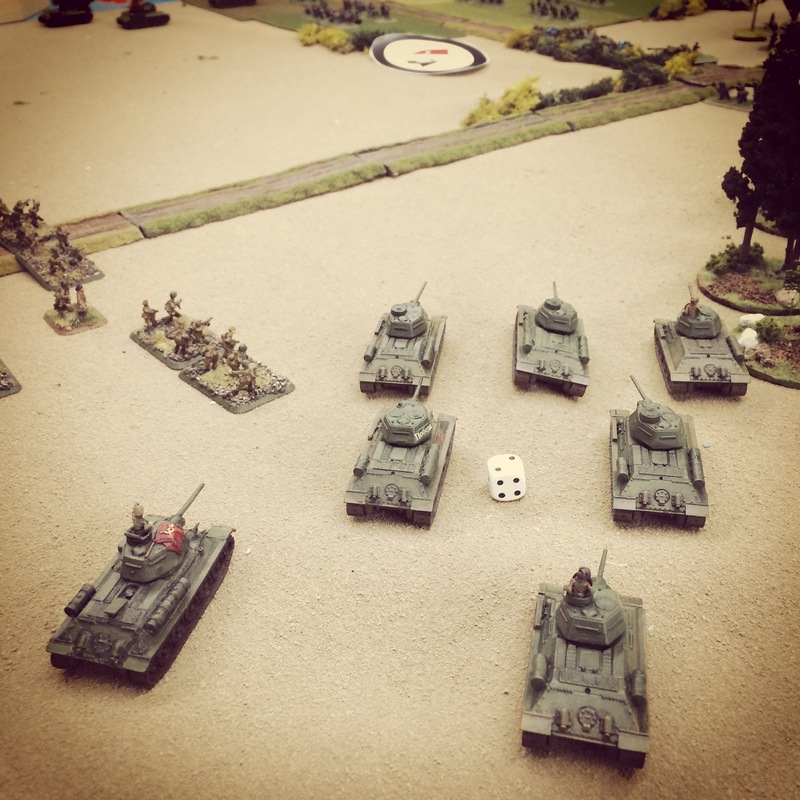 Soviet objectives sat at the German-defended crossroads, and so the T-34s pushed hard in the initial turns toward the road entry at the edge of the table at the Soviet left. Rolling quickly toward the road, the T-34s encountered a Pak 40 position at a hedge dominating a field of fire at the center of the table. 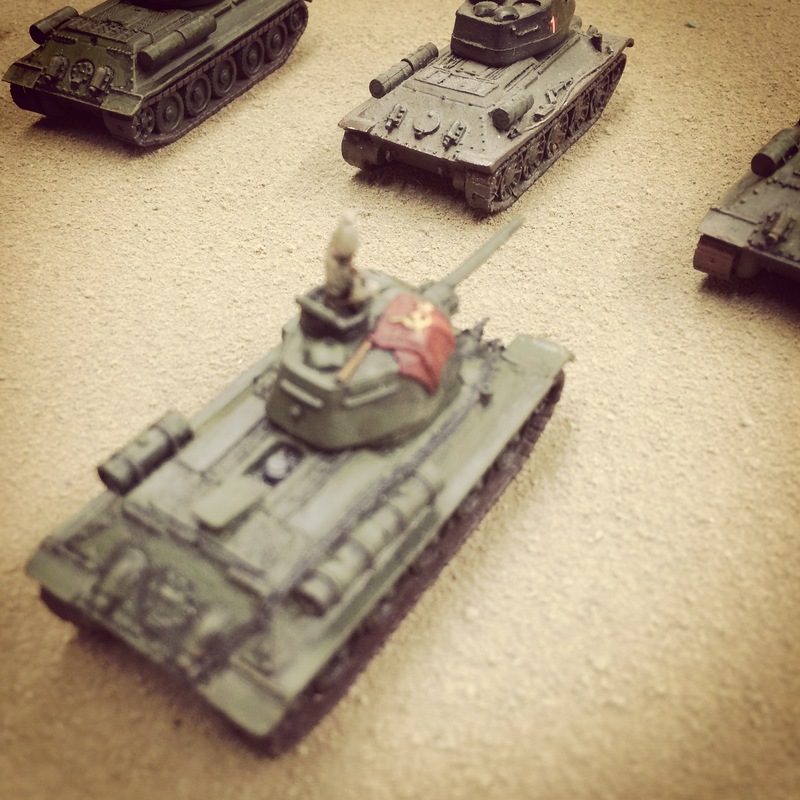 The Pak 40s immediately hit the tanks, damaging the turrets, sights and mobility of the T-34s. Over several turns, fire was exchanged between the T-34s and the German anti-tank crews, leaving several burning tanks and a partially destroyed German gun position. 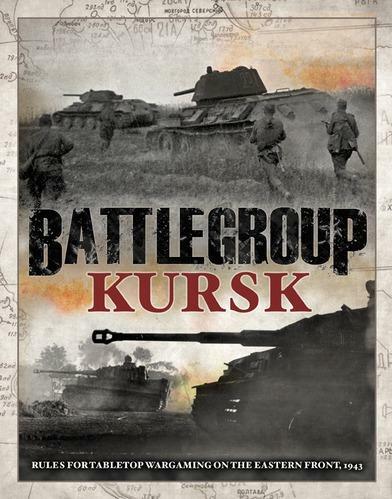 Mid-game, a reinforcing platoon of T-34s moved to support the first wave of nearly-destroyed Soviet armor but were likewise halted in a crossfire from the surviving Pak 40s and three StuGs moving out their hidden positions and toward the road. 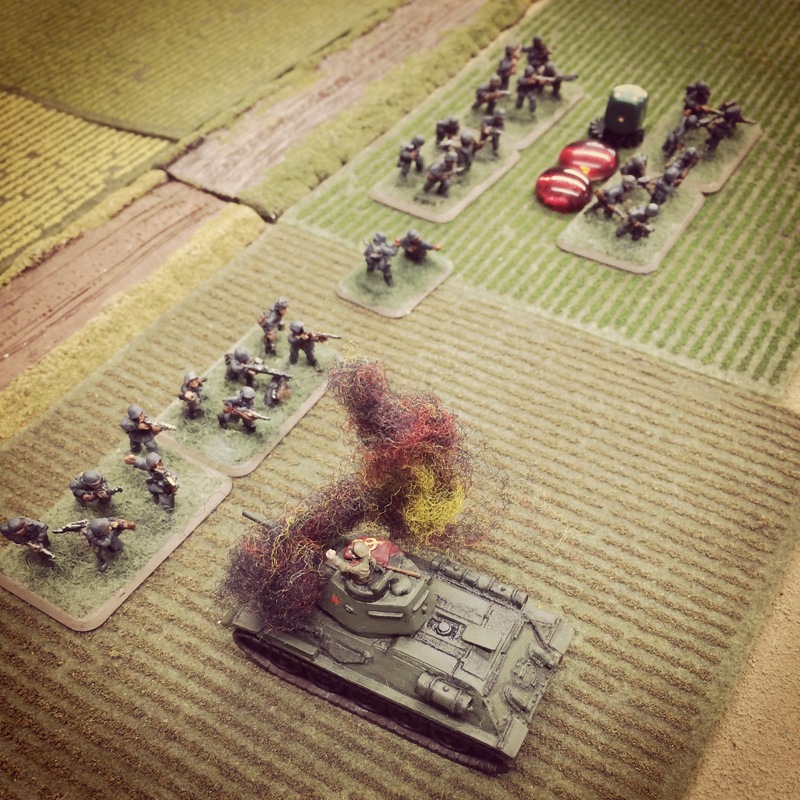 The Soviet tank commander managed to close gloriously on the objective, but the StuGs and hidden German infantry positions stalled the advance and his tank went up in flames with those of his comrades, too. 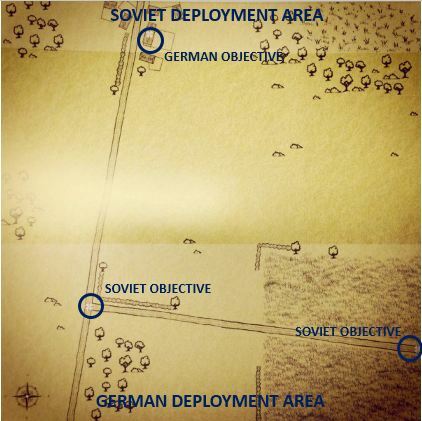 With the Soviet attack on the left completely at a standstill, infantry moved from the farm complex toward the crossroads objective in the distance as T-34s maneuvered to their right using a forested area to cover their advance. 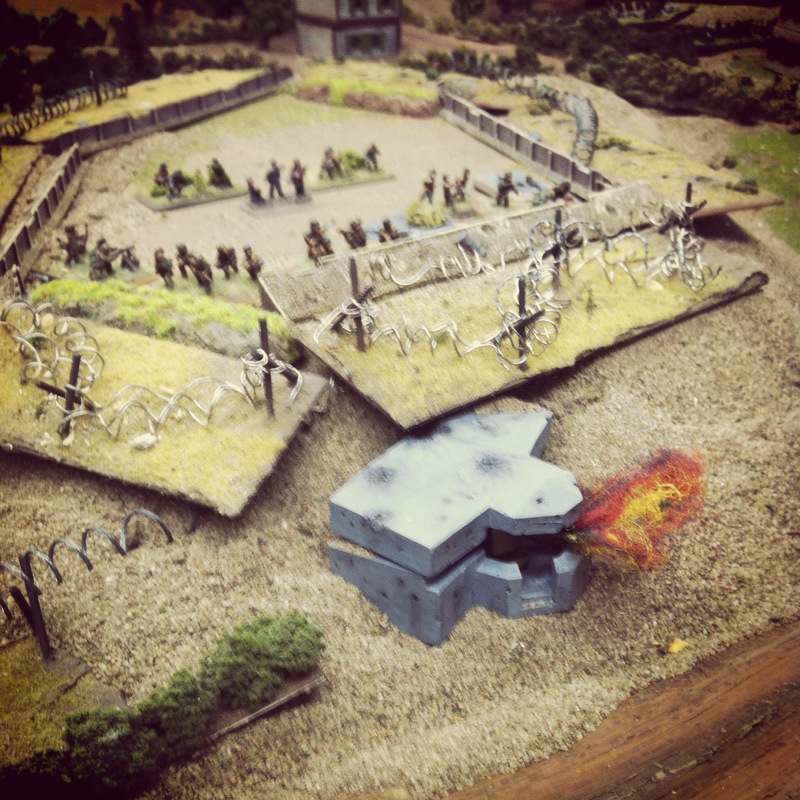 The Germans moved to strengthen their center with the deployment of MG42s which laid fire into the Soviet infantry. 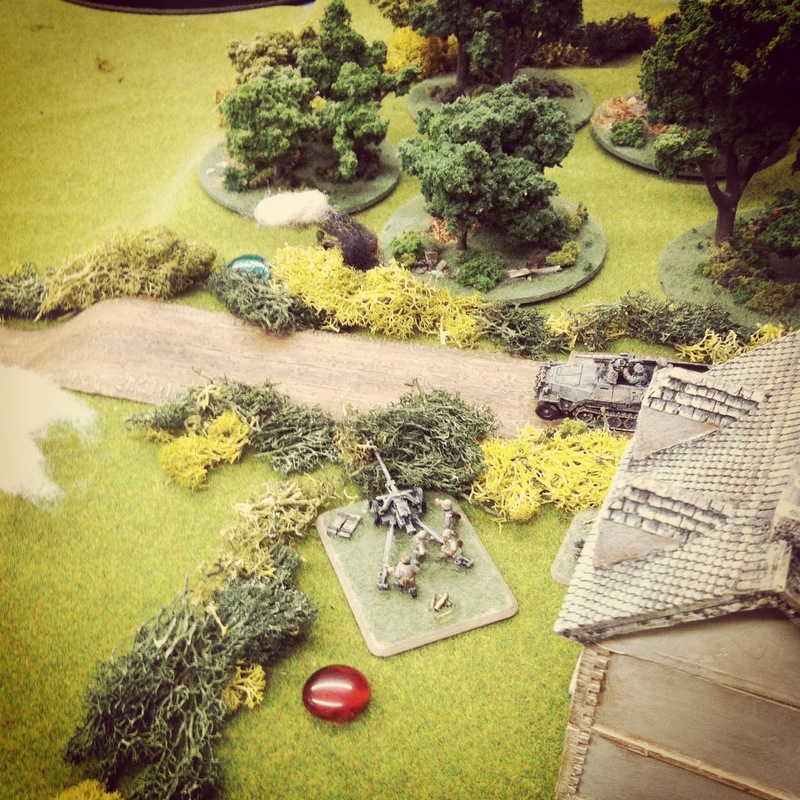 German infantry deployed across the crossroads objective and were buoyed by the support of another StuG platoon on the opposite side of the trees. Between the road and forest, the battle for crossroads began. 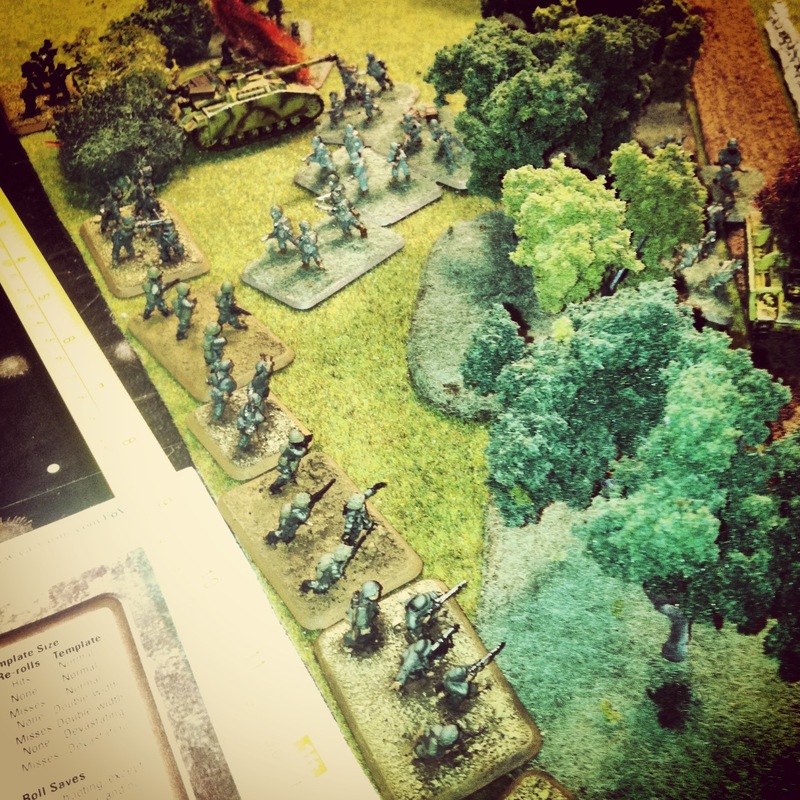 Soviet infantry were cut down in the open and the Soviet armor moved cautiously around the woods to fire into the German infantry and armor. As the T-34s rounded the edge of the forest, a crossfire of Pak 40 and StuG shots stalled the Soviet tank advance with the Germans suffering a loss of only one StuG in the firefight. 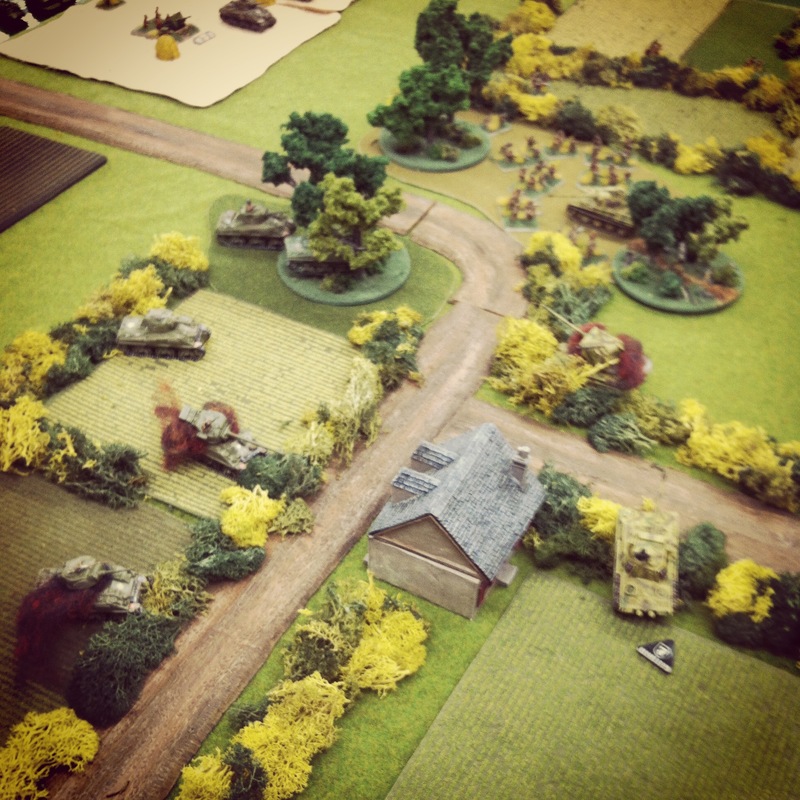 With the objectives at the crossroads and road at the table edge still secure, the day tipped to a German win effectively repelling the Soviet attack. I hardly ever play Soviets, and in a look at the battle afterward I reasoned a consolidated attack to the road on the German right may have provided the critical mass of armor needed to sway the victory. The German anti-tank guns had effectively pinned the center, and a replay with T-34s massing to one side may have provided just enough of a steel wall to allow the other tanks to move to the objective instead of dying in the open. 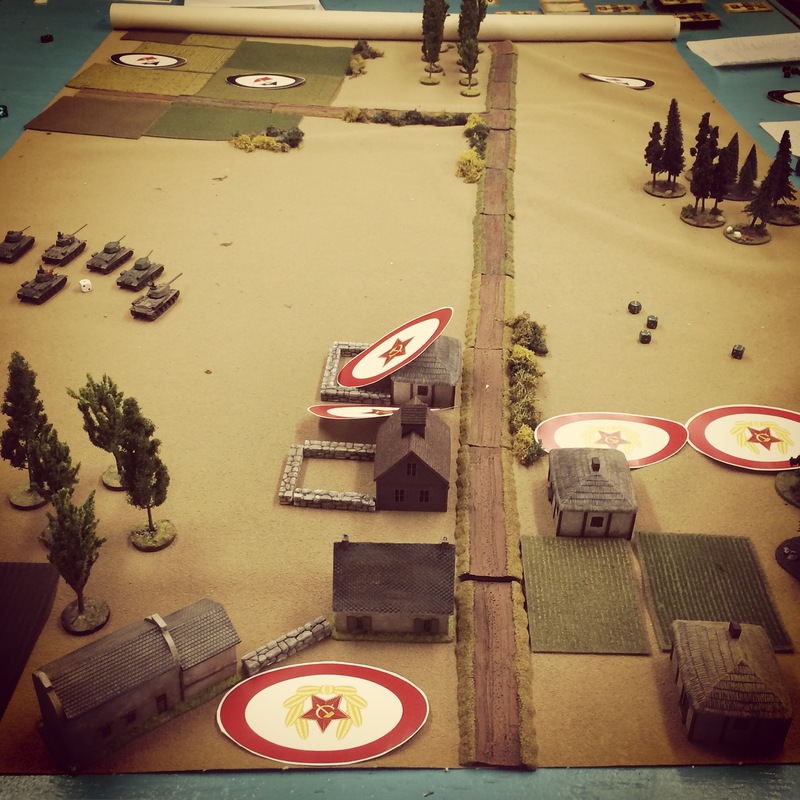 With our largest IABSM battle played out over several hours, we thought having a crack at one of the other Eastern Front scenarios would be worth it to test if Soviet metal might prevail over the German invaders on another day. 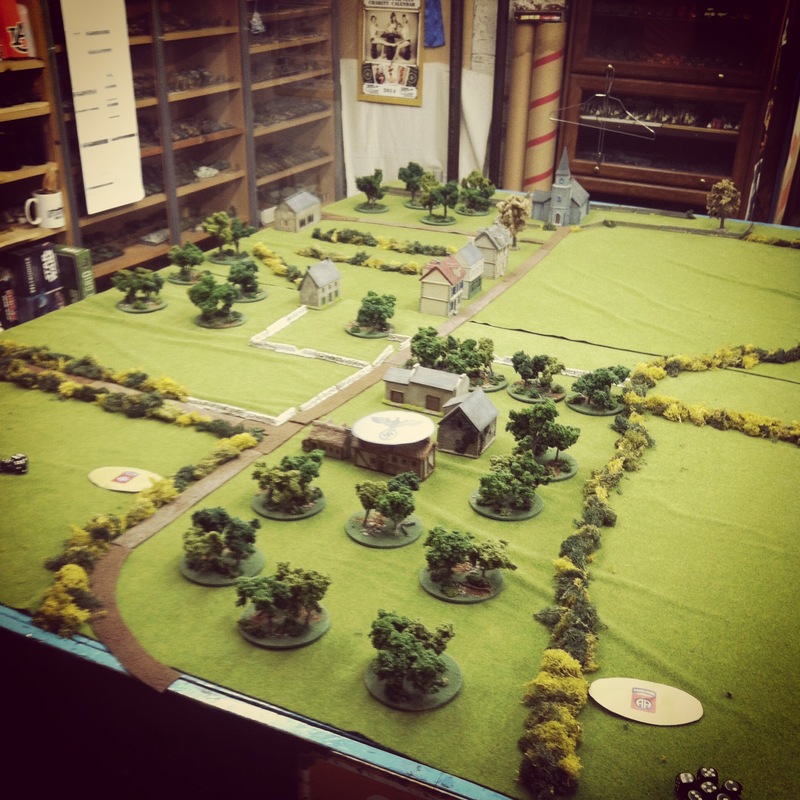 This past weekend at Metropolitan Wargamers in Brooklyn, NY, dozens of gamers came together for three days commemorating the 70th anniversary of the Allied invasion of Normandy on June 6, 1944. 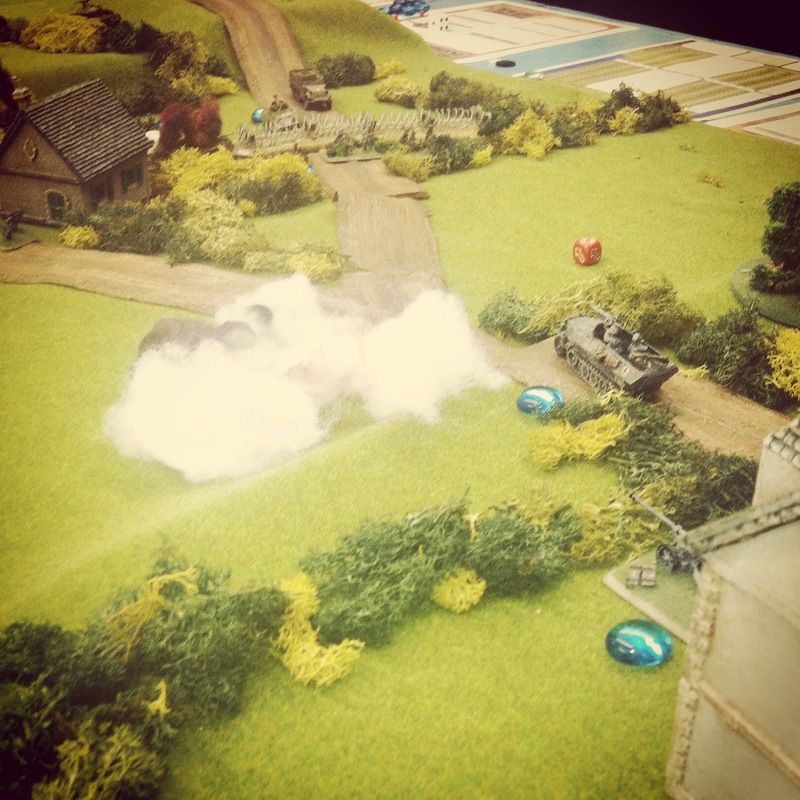 Throughout the weekend, we ran multiple WWII-themed games, including Normandy ’44, I Ain’t Been Shot Mum, Flames of War, World In Flames and Memoir ’44. 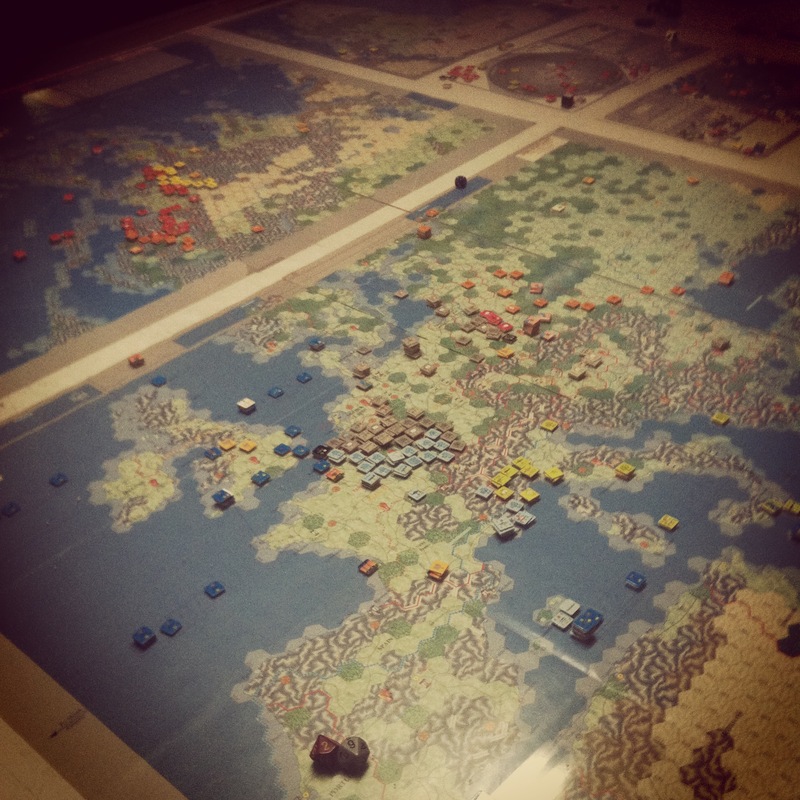 Dice were rolled, strategies were debated, prizes were won and Allied and Axis forces vied for control of France. In all, it was another great weekend full of gaming at our club’s space in the heart of Brooklyn. 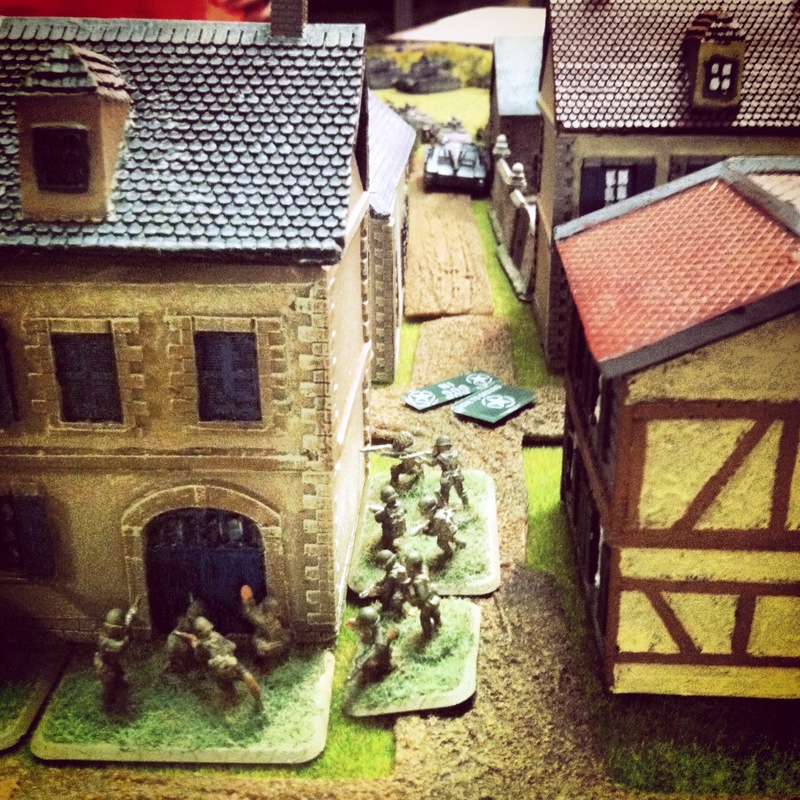 Friday kicked off after work with a few players unpacking a fresh copy of the classic Normandy ’44 from GMT Games. 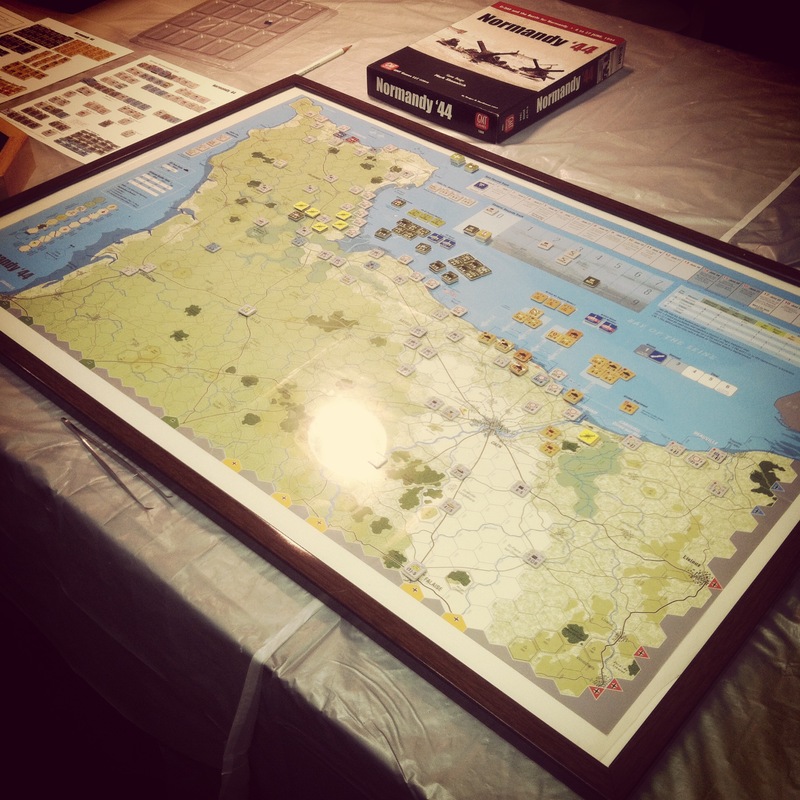 This one-map game covers the pre-dawn D-Day Airborne landing areas, five Allied invasion beaches and the charge to the initial inland objectives. 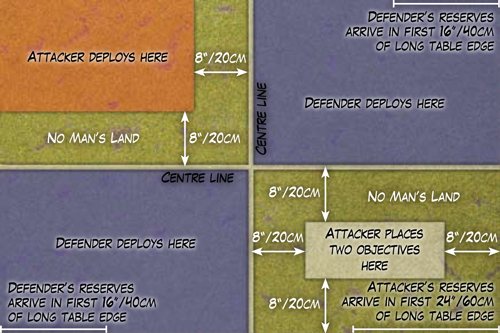 The game scale plays with regiments and battalions with each turn representing one day of action. The small, self-contained game provides a great introduction to game mechanics at this scale with a tight, clear rules set. With a quick look at the game, I decided I’m going to have to personally give this one a shot sometime soon. 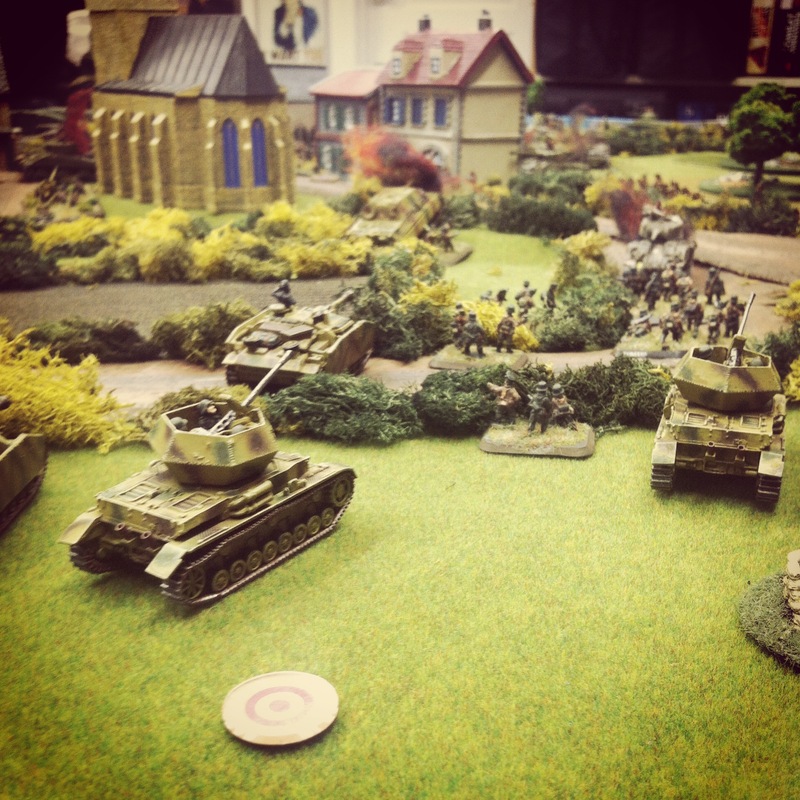 At the back of the club, we ran a game of our new favorite WWII tactical miniatures game, IABSM from Too Fat Lardies. 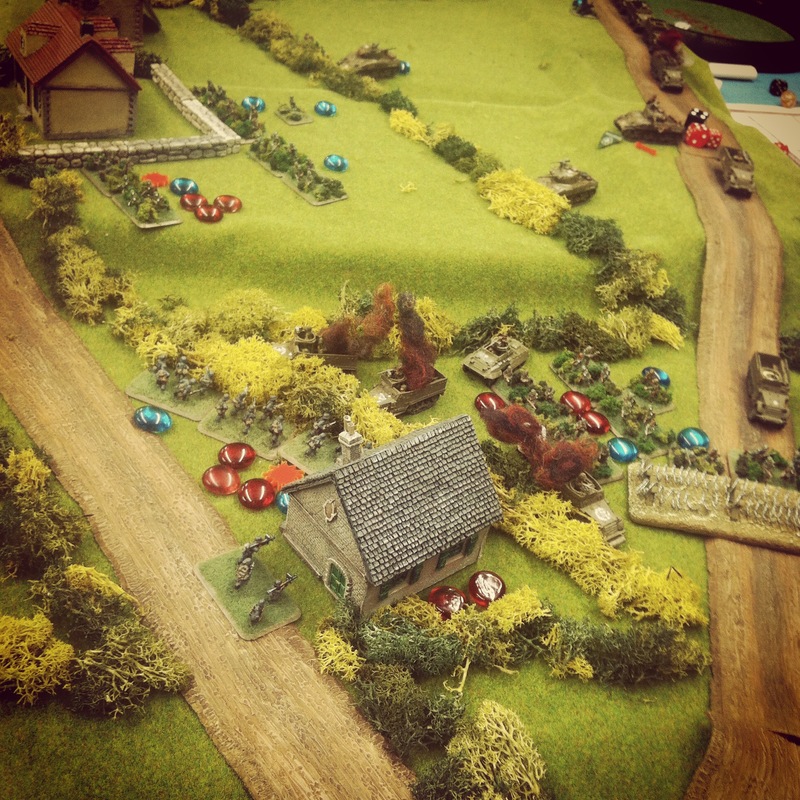 In our ongoing campaign of the Normandy scenarios in the IABSM Where The Hell Have You Been Boys? 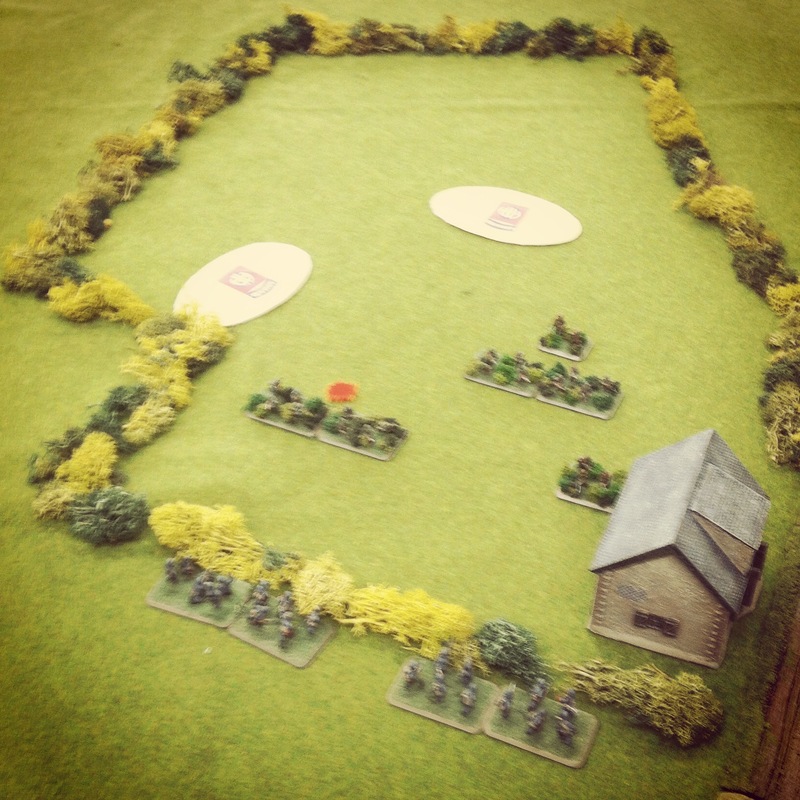 book, our game focused on the battle at Vierville-sur-Mer. With the 116th Infantry Division supported by the 5th Ranger Batallion, the Allied mission was to drive inland to capture and defend the church at Vierville. 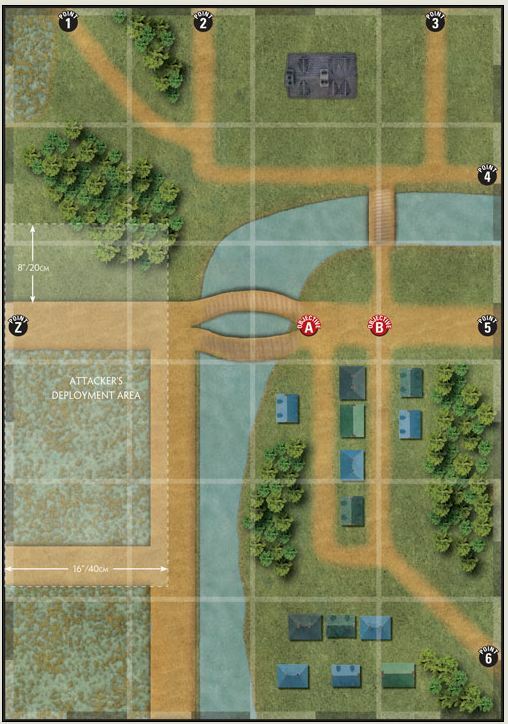 As per the scenario, initial Allied blinds approach a farm outside Vierville where a German blind sits unknowingly in the complex of buildings. 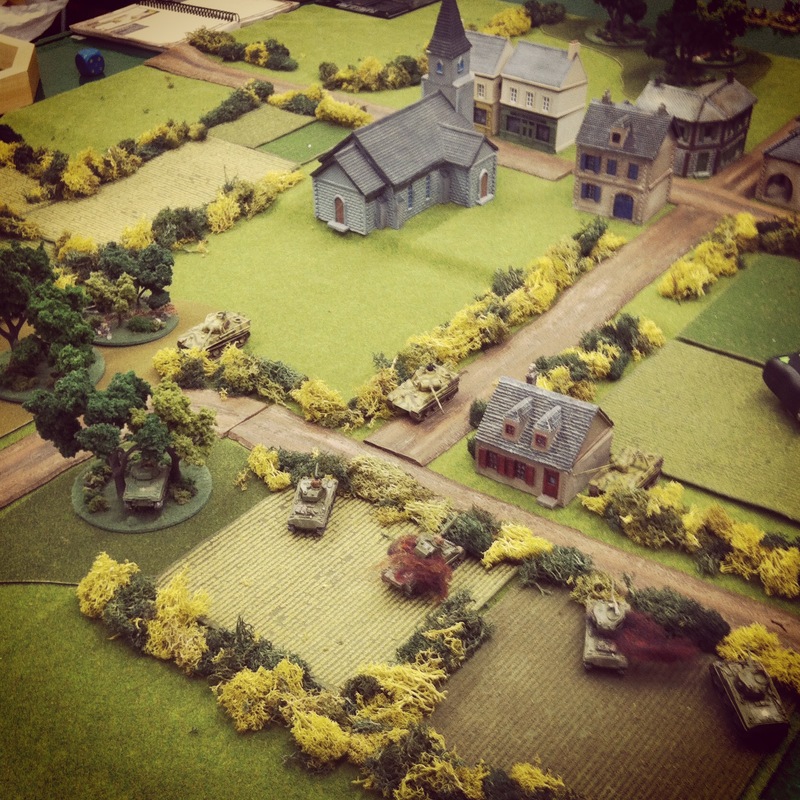 With Allied infantry closing in over dense bocage hedgerows and orchards, a firefight erupted and drove the German defenders through the buildings and into the orchard beyond. 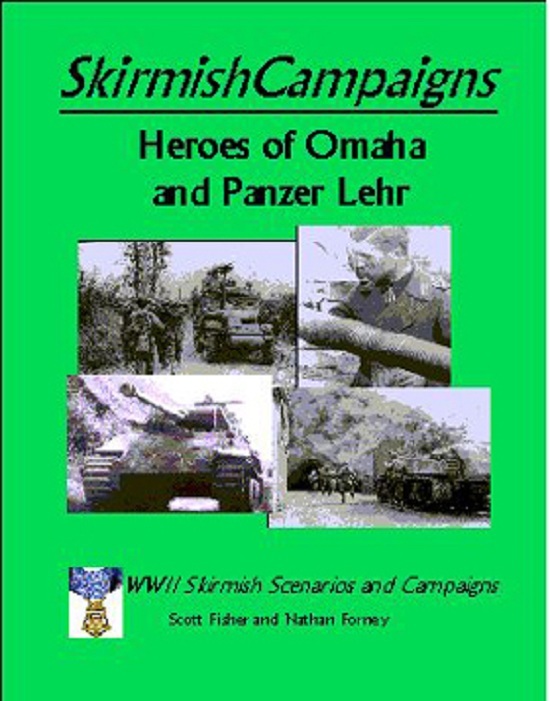 As the first force of Germans fled the farm, their reinforcing comrades came on to the rear and flank of the US infantry. 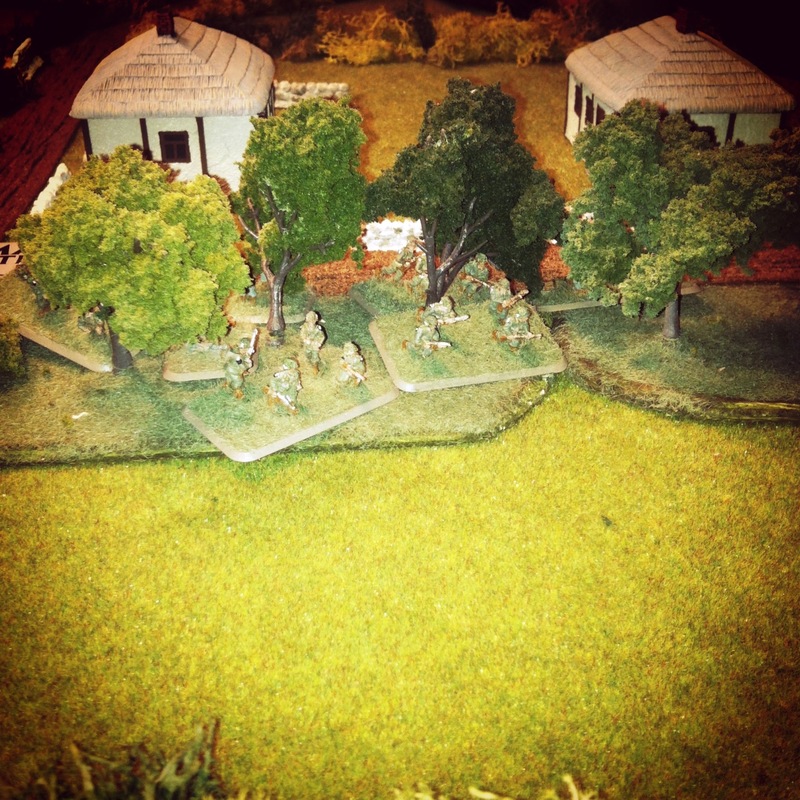 The Americans made consecutive moves of firing and moving back to defend at a series of stone walls across the road from the farm. The retreating defensive US actions held off the German onslaught until enough Americans could take up position amid Vierville’s houses. 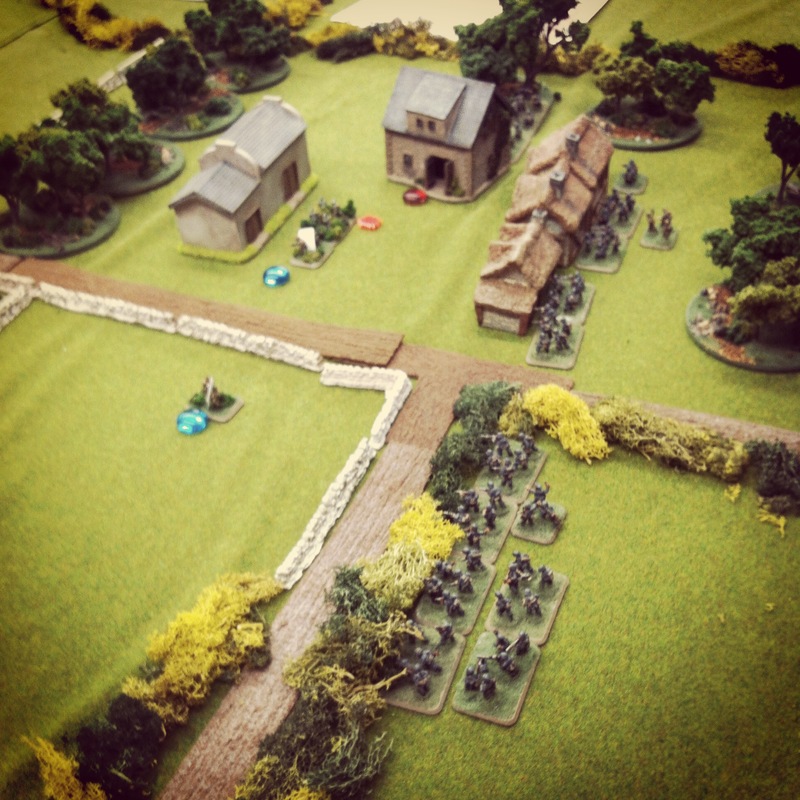 At the same time, the US Rangers moved in at the far end of town to hold the objective at the church. The game eventually settled into a bloody house-to-house and hedge-to-hedge fight along the road leading toward the church. Occasional lucky shots from US Ranger light machine guns at the church also harassed the Germans lying low behind their stone wall position at the farm’s orchard. By midnight, much of the initial American force had been destroyed or was retreating to a final stand at the church held by the Rangers. While the Germans had also lost a sizable amount of their force, their heavy machine guns were still in play as they closed in through the town. This time around, we called the action at Vierville a draw. The next day kicked-off with a running of a FOW beach landing at Easy Green on Omaha Beach. 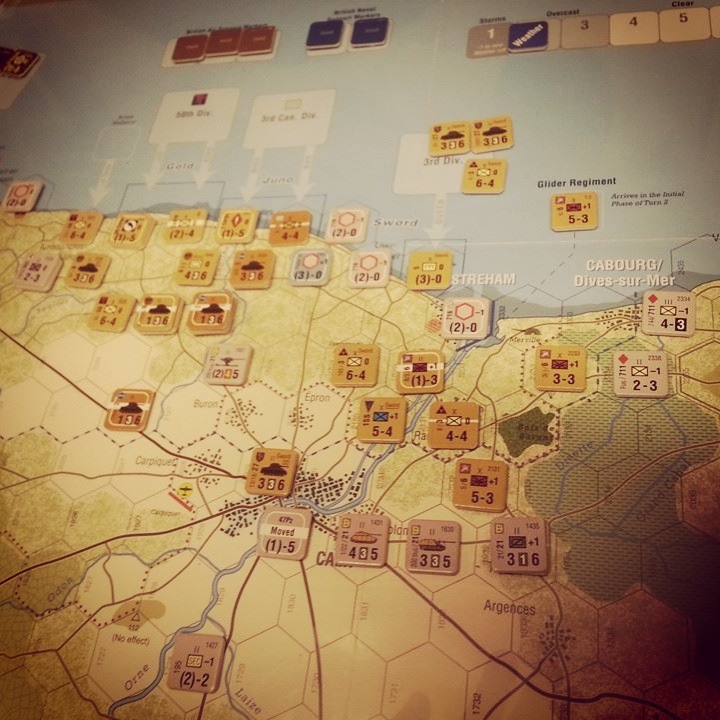 We have been play testing the FOW scenario over the past two months, tweaking our forces and strategies to cope with the clumsy beach landing rules. In our past games, the US invaders only manage to win about a third of the time. Even so, we decided no D-Day weekend was complete without a return to “Bloody Omaha” on one of the club’s award-winning sand tables. The opening turns found a lot of US boats on the beach and a quick push to the seawall. So early combined arms fire managed to destroy the main bunker at the beach, but the battle was far from over. The initial US push followed on to the left of the beach, but multiple turns at clearing the barbed wire stalled the advance as the Americans took heavy fire. As US armor arrived, several tanks managed to drive off the beach to the minefield position to lay down fire on the German trenches. One tank wound up spending three turns bobbing in the surf offshore only to arrive and bog for two more turns on the beach. As this most inexperienced tank crew in Normandy struggled, the other Shermans took fire from German rockets and reserve tank platoon which rolled to bulk up the beach defense. American artillery also arrived but proved pretty ineffective to the Germans at the trenches. Wave after wave of US infantry pushed to the trenches, eliminating most of the defenders but never managing to clear the barbed wire lines to seize the German position. 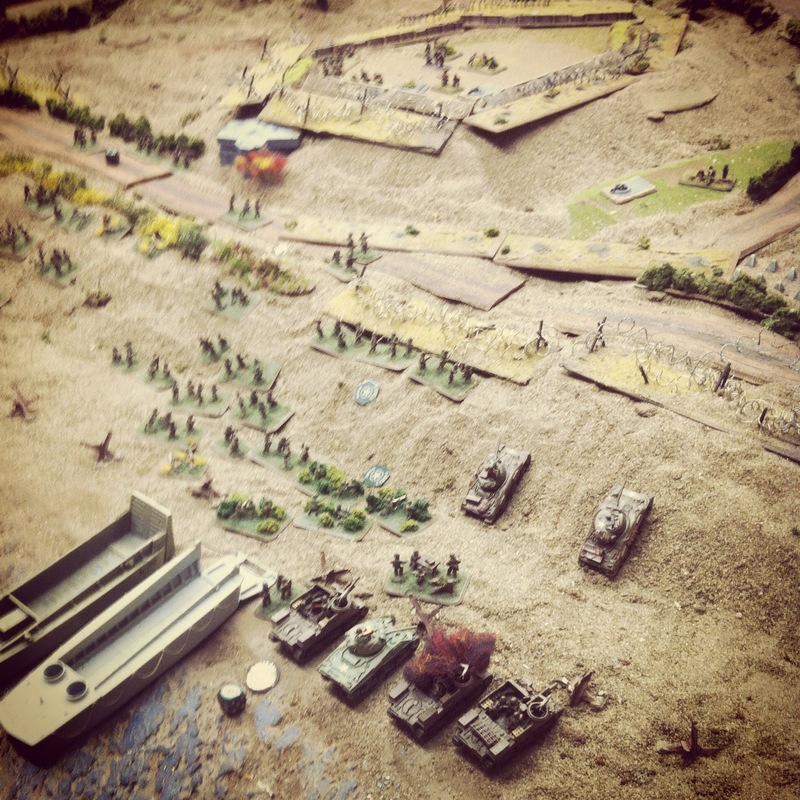 At the final turn, the Americans just hadn’t made enough headway to control the beach. 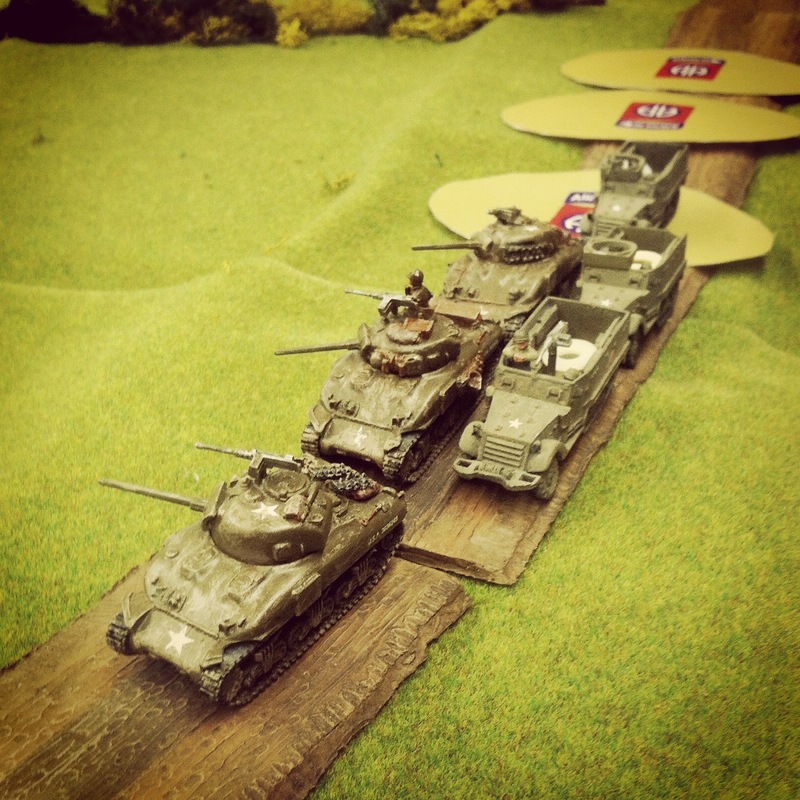 With action raging on the sand table, a group of club members showed up to continue playing their massive World In Flames game. Australian Design Group’s WIF from 1985 is the standard in grand-scale strategic fighting of the entire WWII period. The game’s rich playable detail, dizzying number of 1400 playing counters and sprawling maps makes it a commitment for only the most experienced gamers over many months of play. 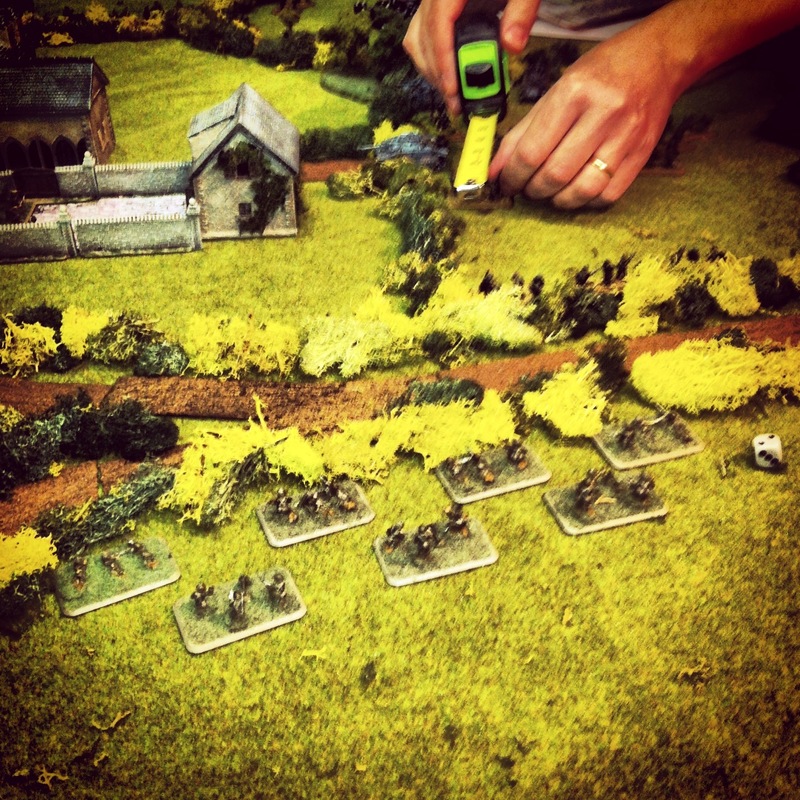 The Normandy ’44 game from the evening before concluded with a decisive Allied victory Saturday afternoon. 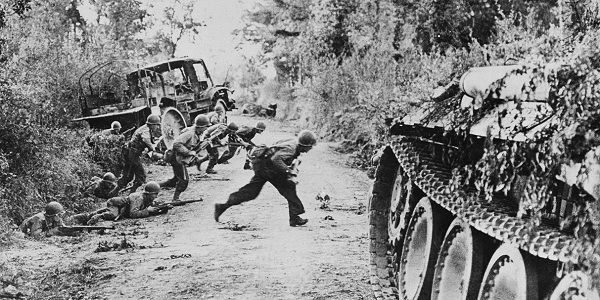 Pushing the Germans back from all but Utah Beach, the Allies captured Bayeux and several smaller towns. With German defenders routed from roads leading inland from the landing beaches, the victors rolled in to control half of Caen by the game’s end. Saturday also included a lot of other club members down for the usual variety of board, Euro and card games, making for a packed house. 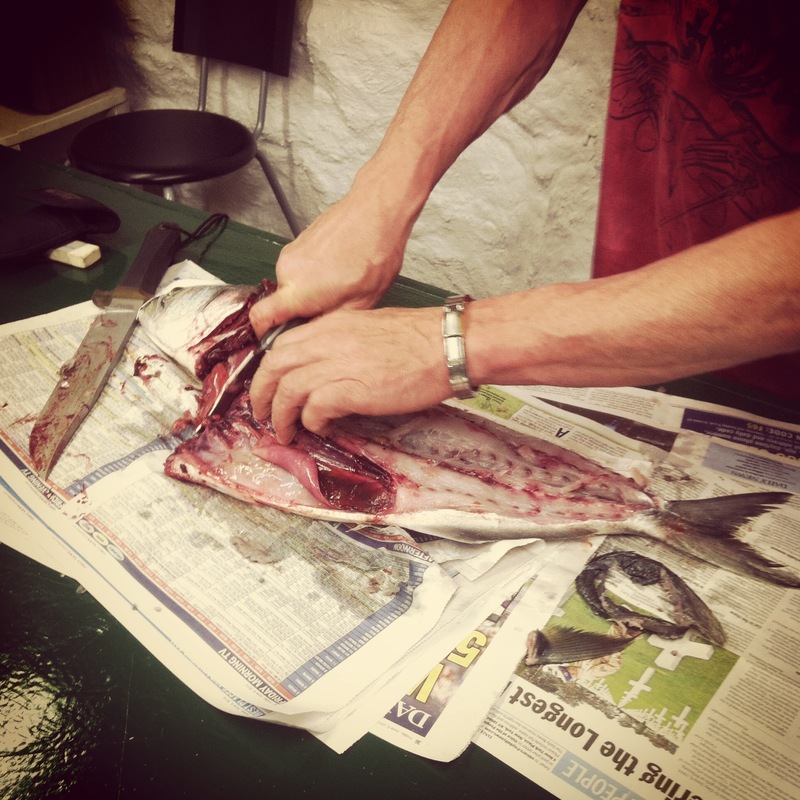 As the crowd rolled in, a longtime club member showed up with an enormous fresh-caught fish which he proceeded to gut with a huge military-style knife. With fish on the grill and food ordered in, there was plenty of food to sustain the crowd of gamers throughout the day. 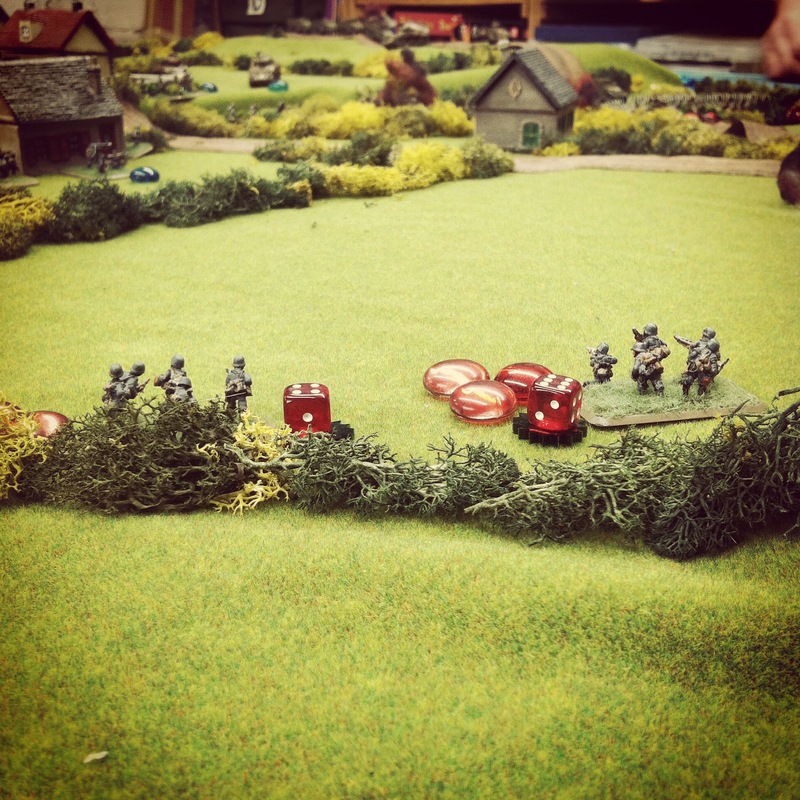 We all took a mid-afternoon break to dice-off in a game, books, DVD and miniatures raffle to raise funds for the club. I was fortunate to score a copy of A Few Acres of Snow from Treefrog Games, and another lucky person picked up an unused copy of out-of-print the Games Workshop classic Dreadfleet. 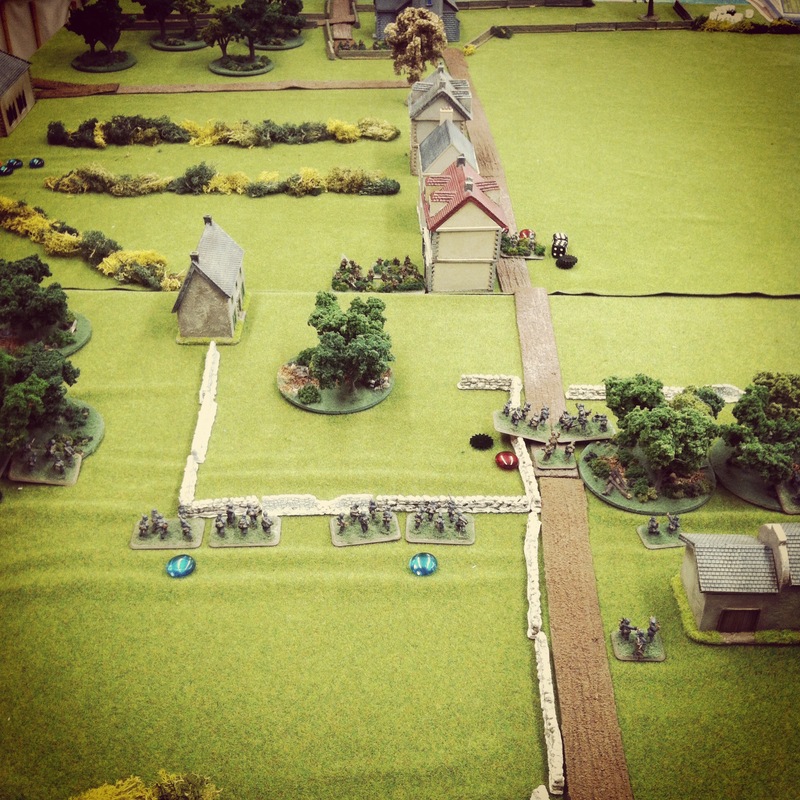 As the main crowd thinned out, we ran an evening IABSM game continuing the assault beyond Easy Green. 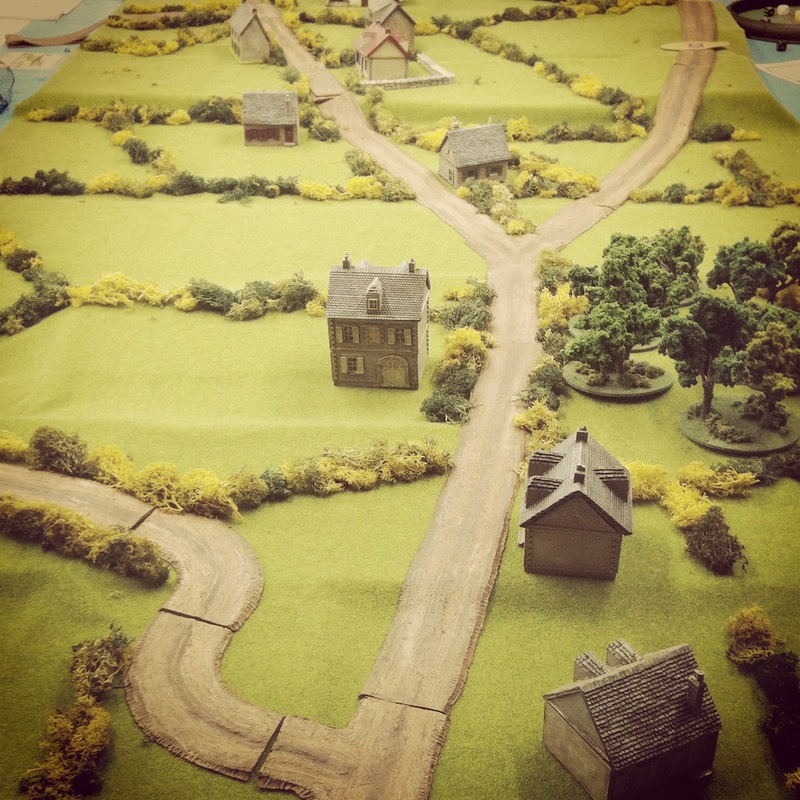 The scenario found initial US forces deployed around a small French farm with the objective of moving men off the table on the roads beyond. 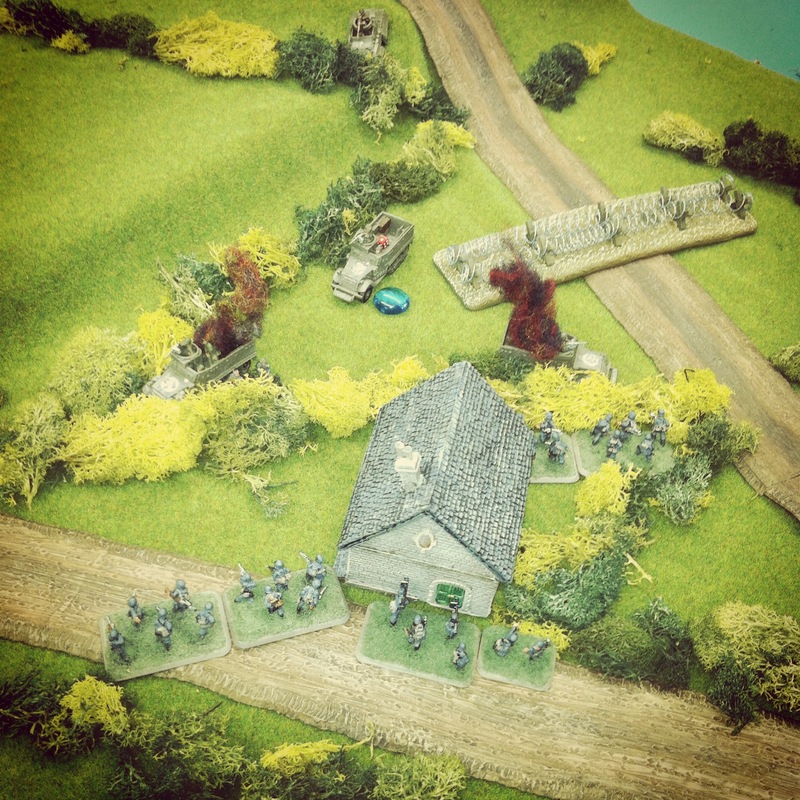 The Germans were tasked with preventing the American advance and seizing the farmhouse stronghold. 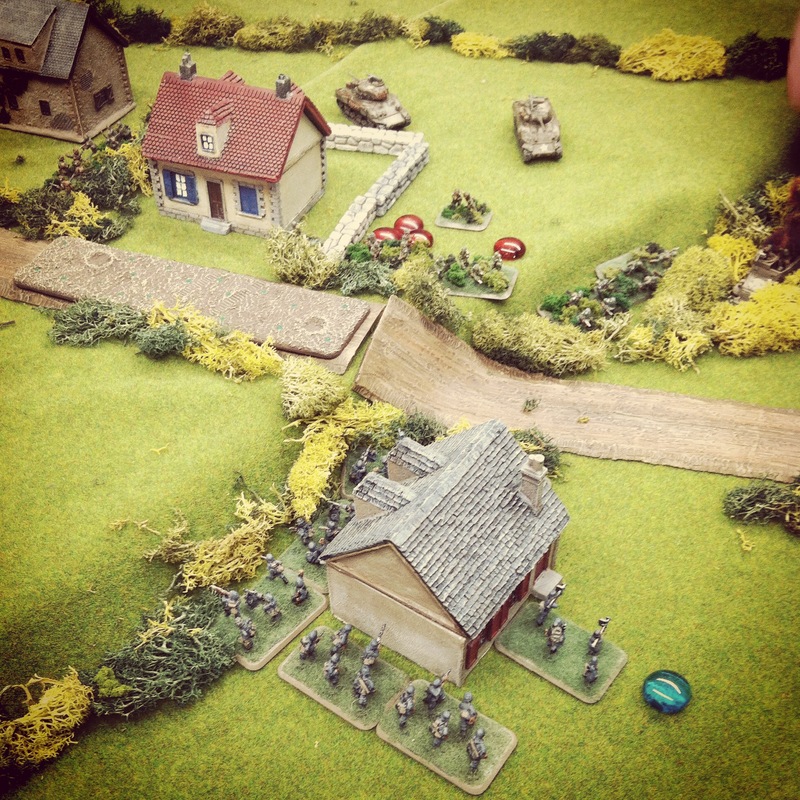 Using initial blind deployment, Germans quickly moved to the farm along thick hedgerows as the Americans drove into the building for cover. 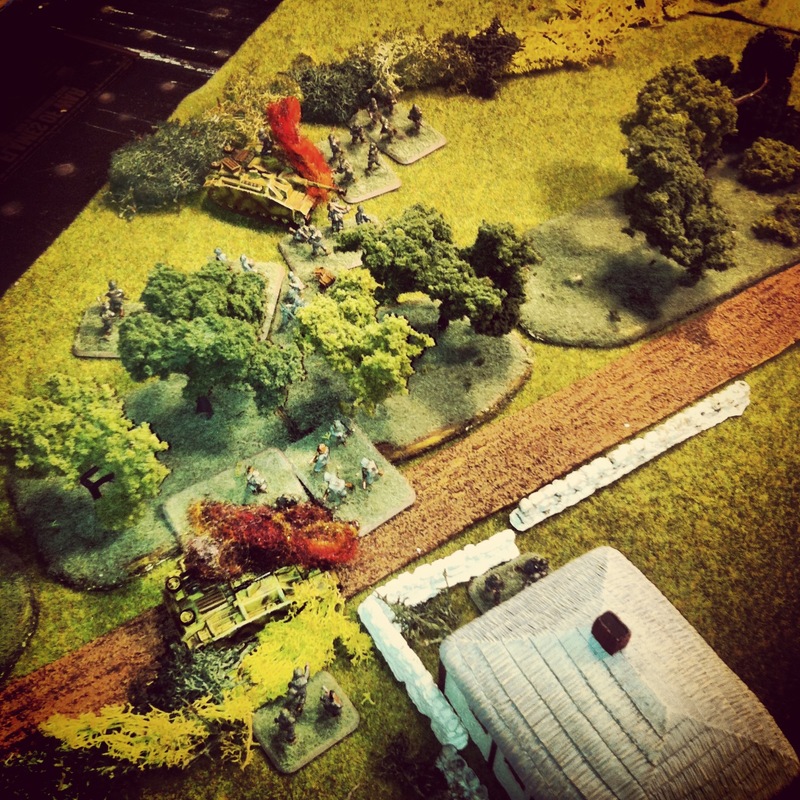 Turns followed with the Americans jumping from cover to fire on the dwindling German force which returned fire over the hedges to unfortunate US infantry hanging out in the open. 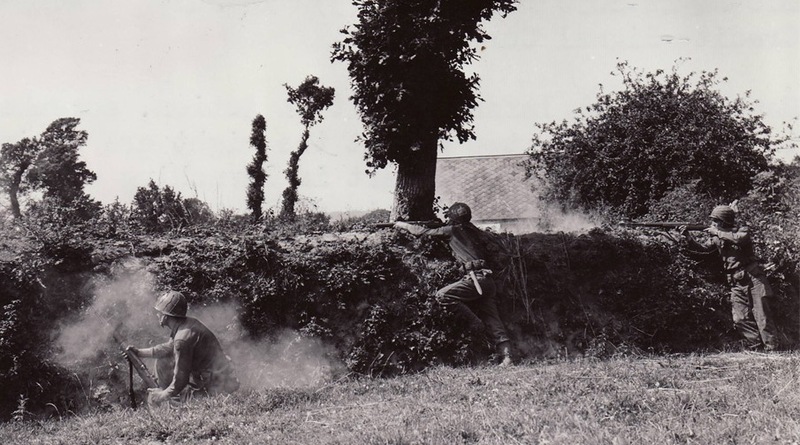 A US flamethrower attack from the window of the farmhouse decimated another German squad sitting close behind a nearby hedge. 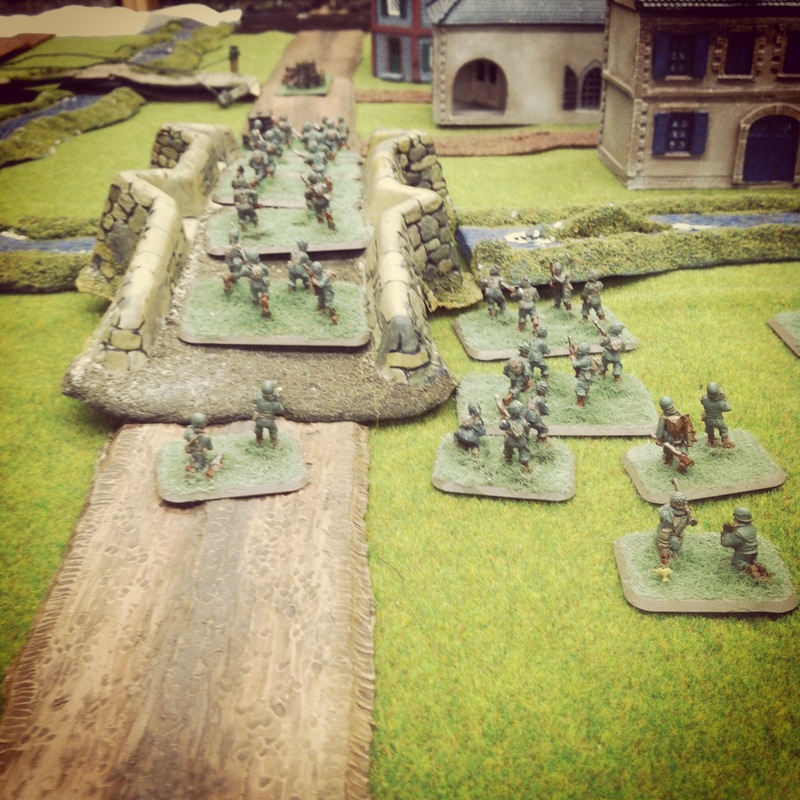 Pressing their luck, a group from the farmhouse made a run for the road exit only to be stalled by a reinforcing German heavy machine gun squad. 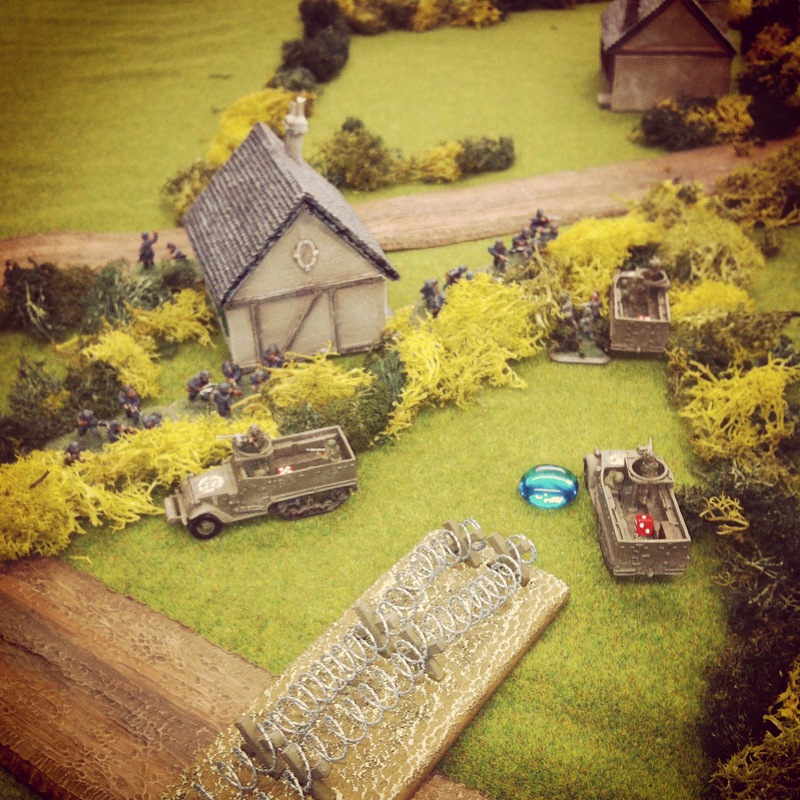 Returning fire, the German MG42s were eliminated from their position in the open field. However, the damage had been done. 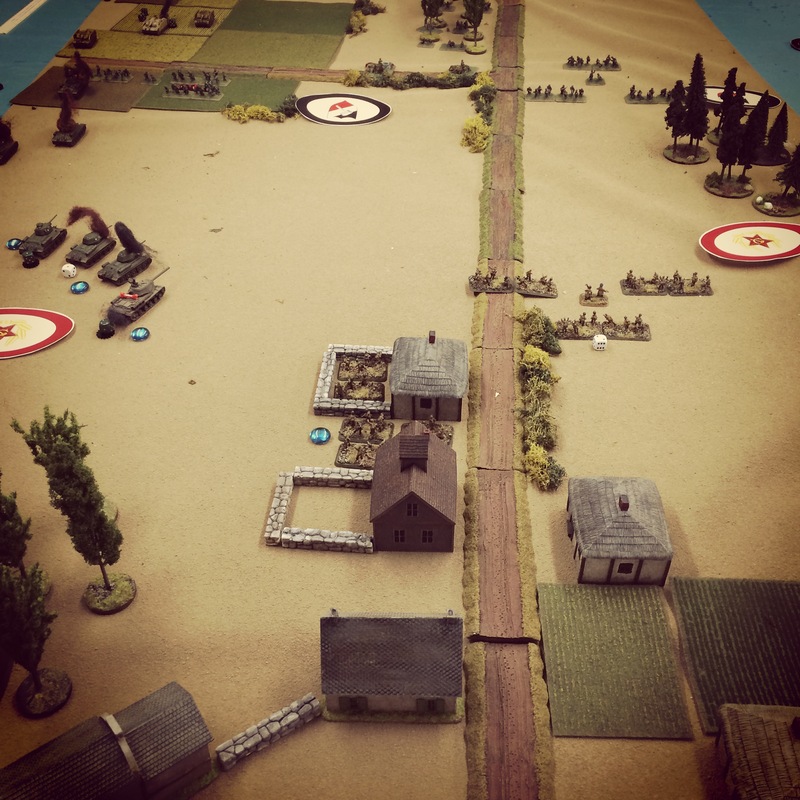 Although the Germans had not captured the farm objective, the Americans no longer had a sufficient force to push off the table. The night ended with a German victory beyond Easy Green. 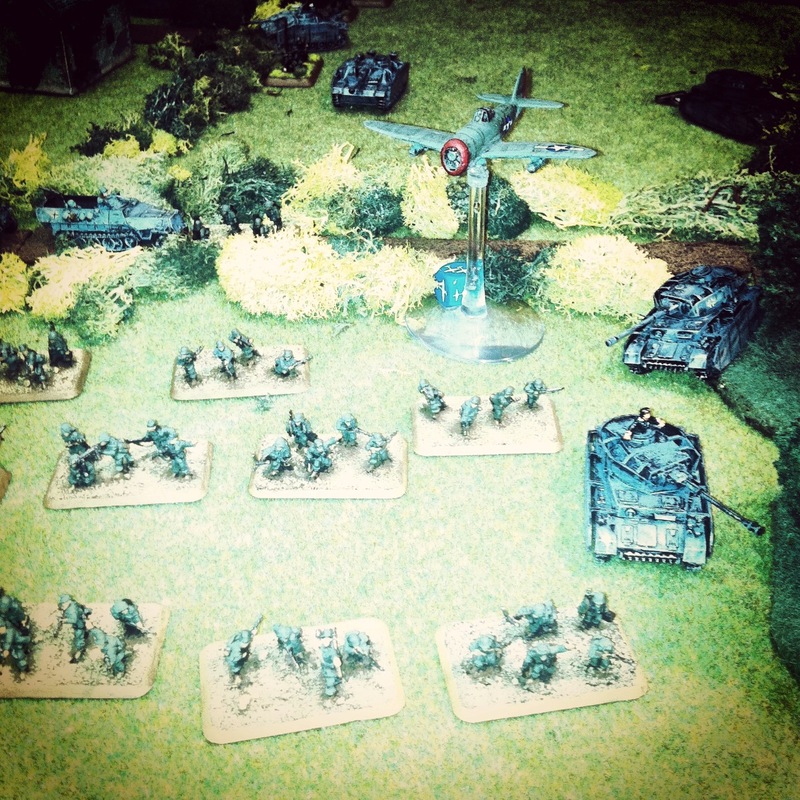 With the first days of Operation Overlord behind us, Sunday’s game focused on the breakout actions. 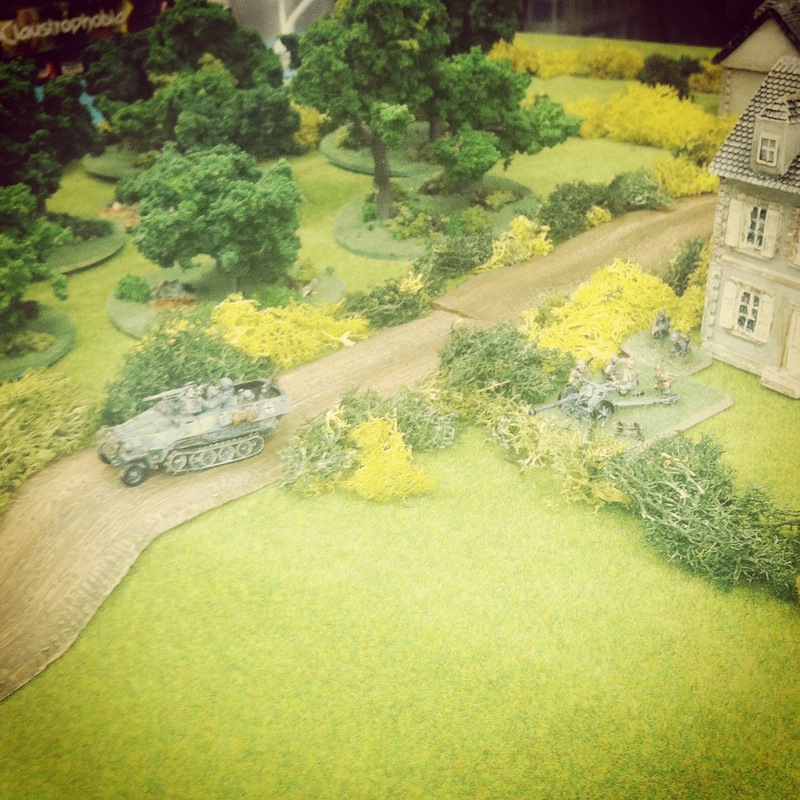 A couple visiting players showed up for the club’s Memoir ’44 game around noon on Sunday. 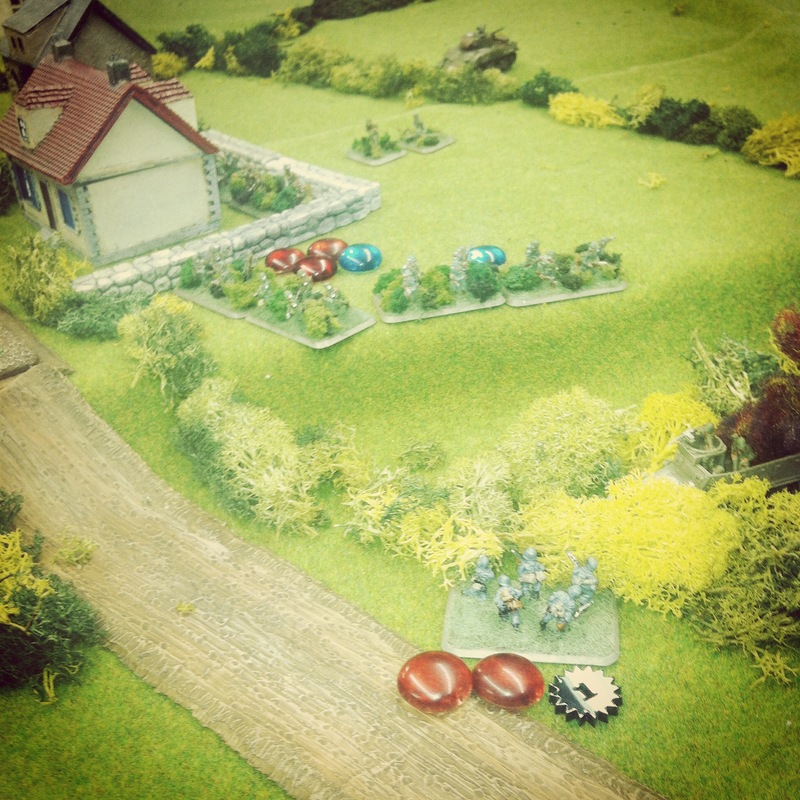 Using the wide Hedgerow Hell expansion map, the Allies beat the scenario odds to win the game in the Overlord scenario. 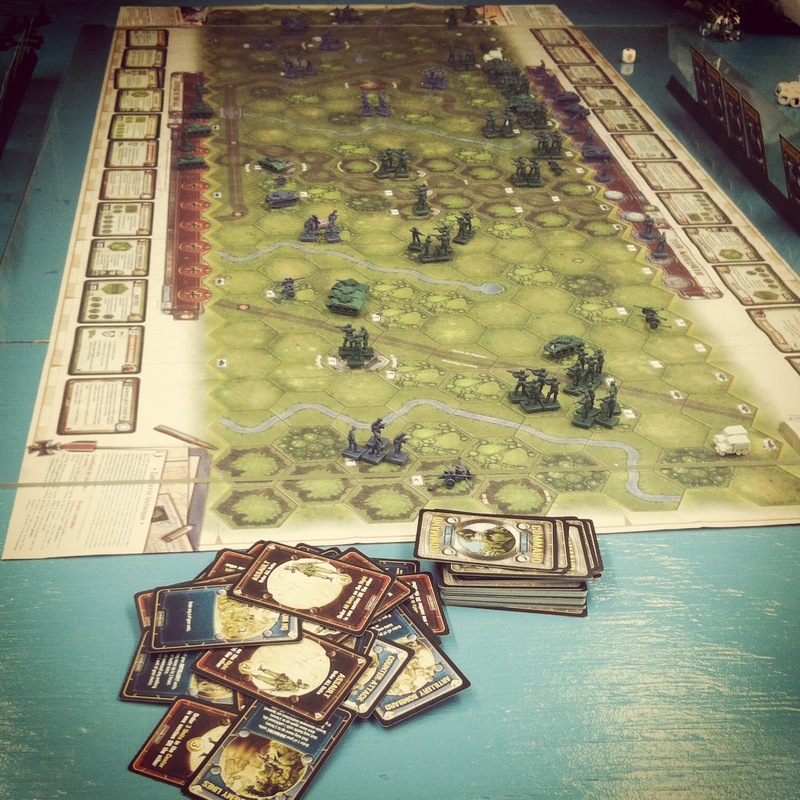 There was much talk of getting larger games of Memoir ’44 back in rotation at the club soon, so hopefully getting the game back on the table will bring some renewed interest in the coming months. 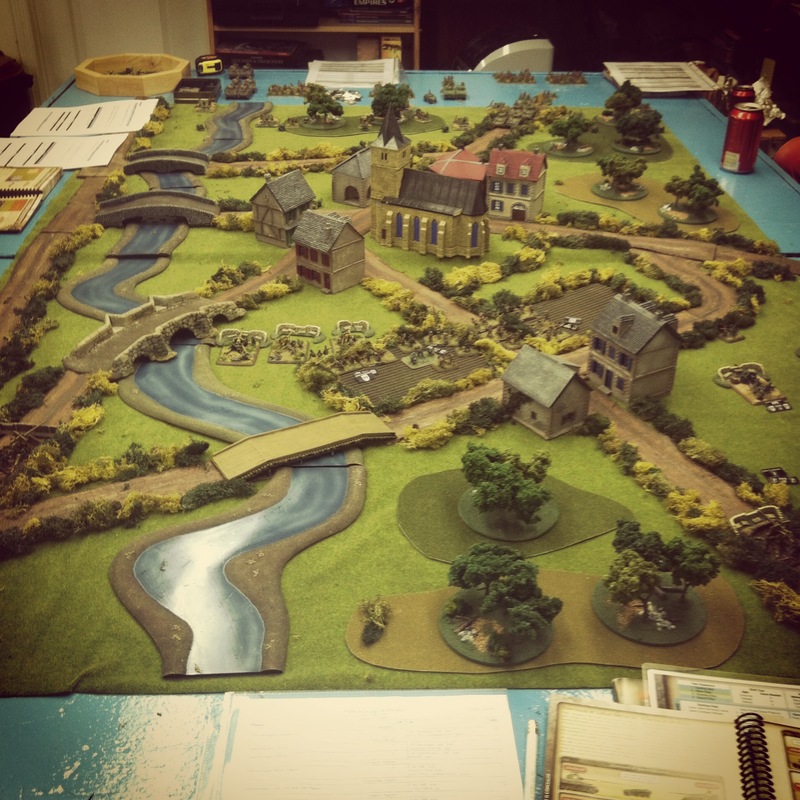 I finished off my weekend as the British at Lingevres using the same scenario I first ran at the club a few months ago. 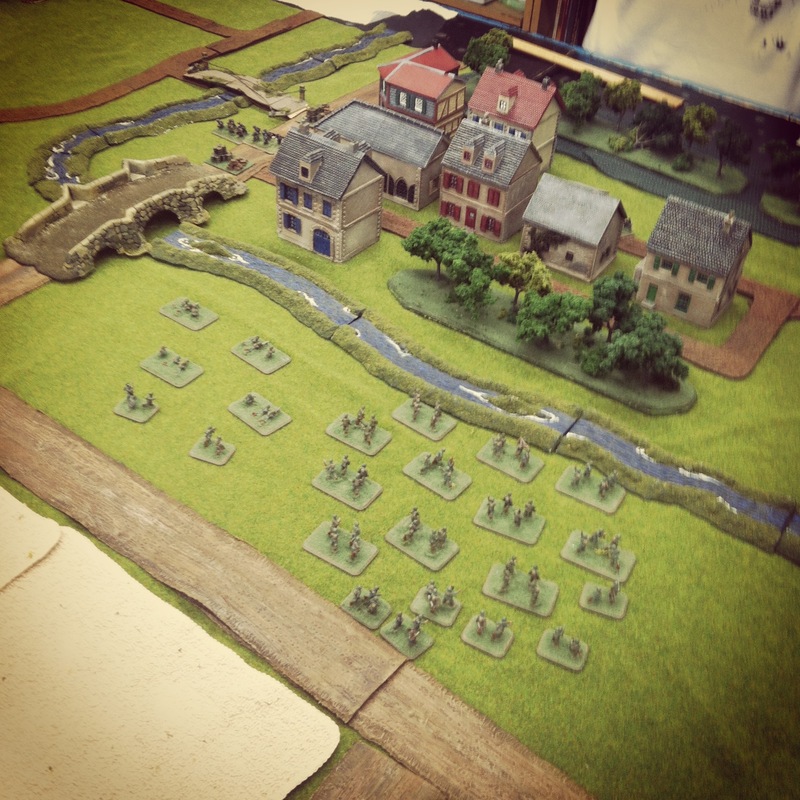 The mission ahead for the Brits was to move into the heavily defended town and take two of the buildings. 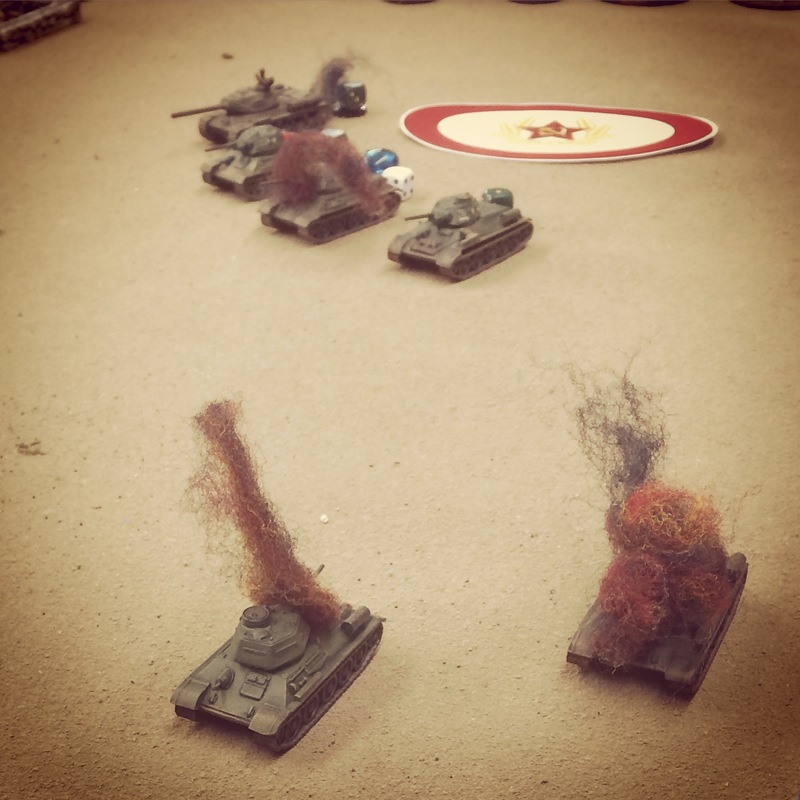 Historically, the battle played out as a tank duel between UK Sherman Firefly and German Panther tanks, and our game this past weekend played out in a similar way. 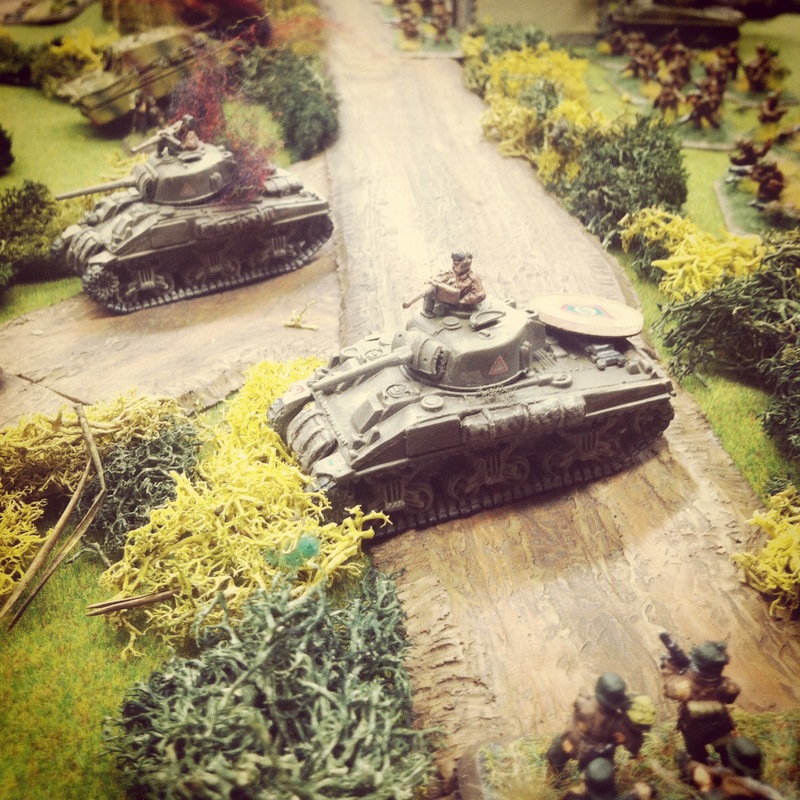 At the outset, my first platoon of tanks got a bit overly aggressive and charged into contact with the full Panther platoon at the farm outside Lingevres. 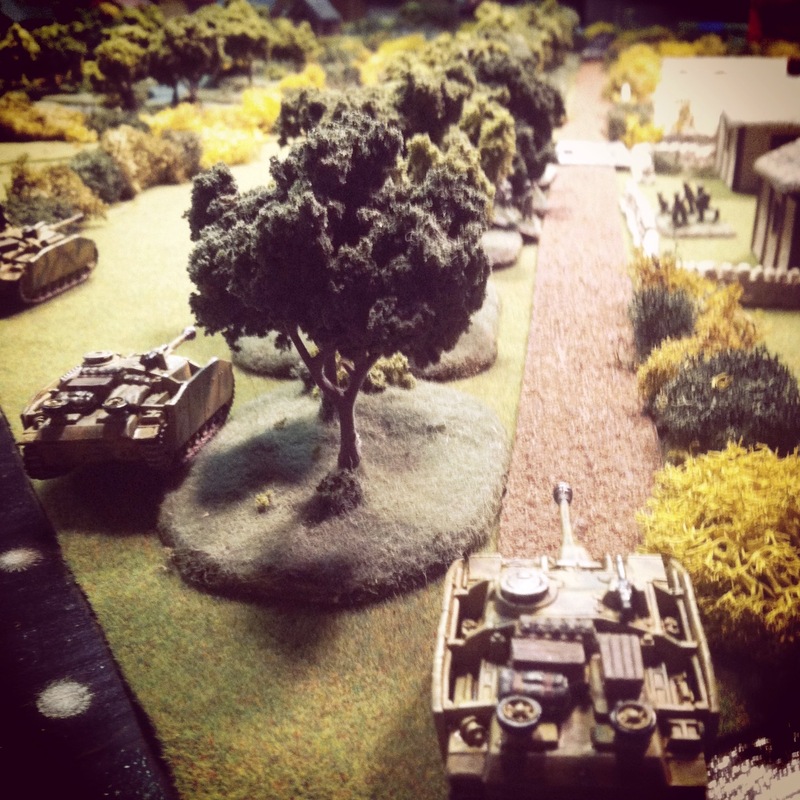 With the first Firefly destroyed in the opening turns, my remaining Shermans pulled back as the Panthers rattled to the middle of the field to hold off UK infantry advancing through the woods and bocage-lined fields beyond. One Panther bogged on a hedgerow and another was destroyed in an initial volley from the Royal Artillery in the fields outside town. 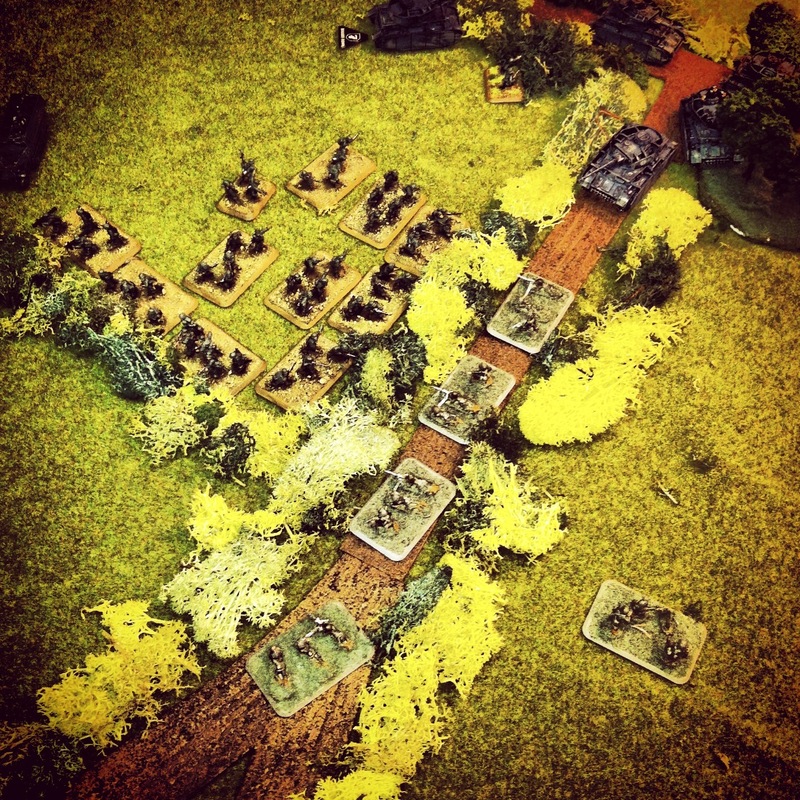 Several turns became ensnared in attempted infantry assaults on the third Panther in the woods, but eventually the German tank rolled away to deal with the building reinforcing infantry and tank platoon in the fields on the other side of the table. 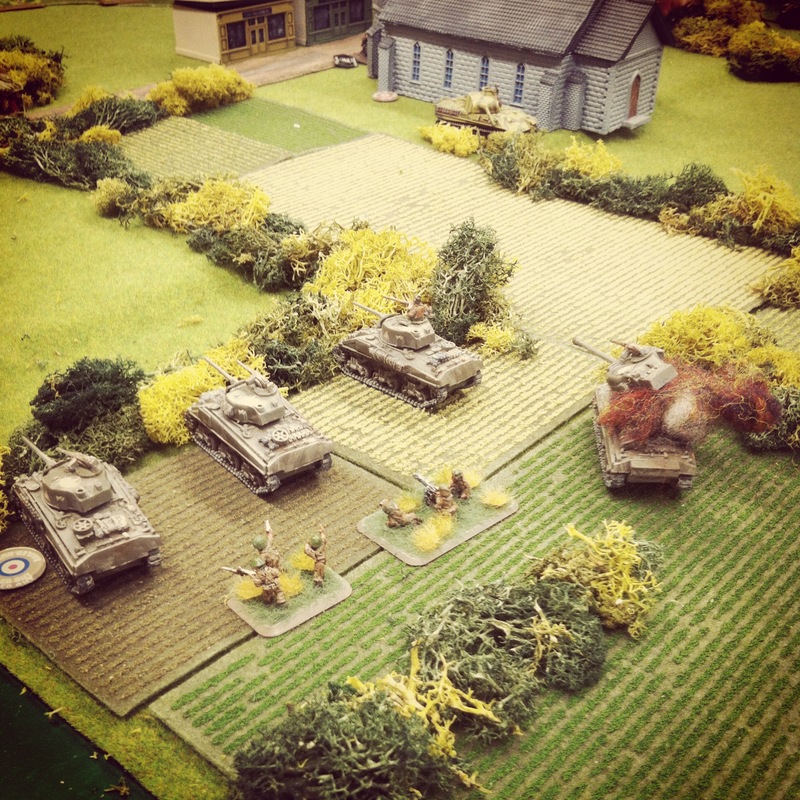 With the Panthers moving away, fresh British infantry and the surviving Shermans moved to the farm and fields beyond. 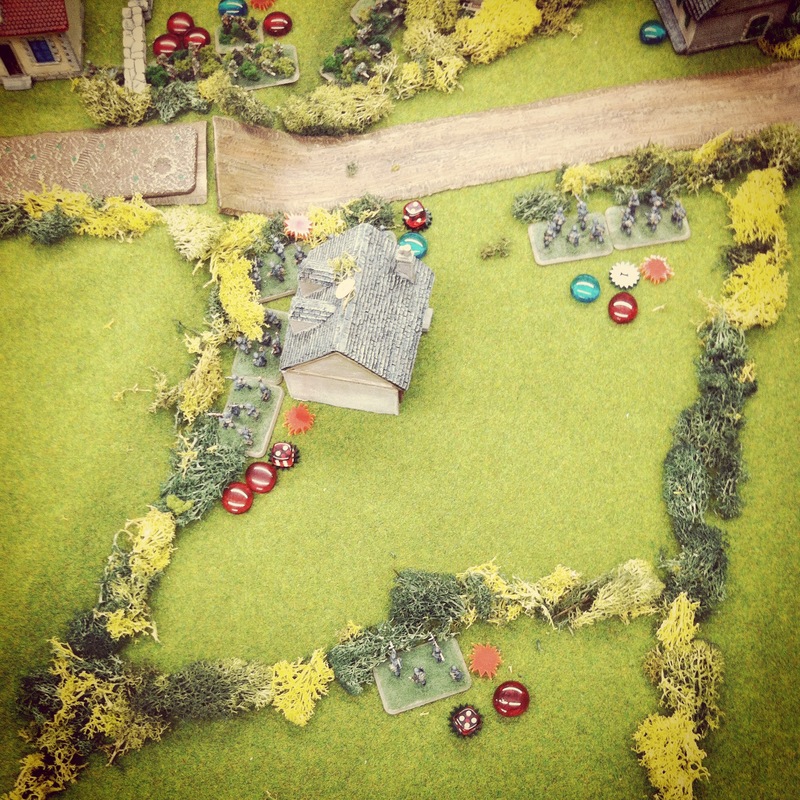 British artillery fire winnowed and pinned the German platoon in the church over several turns. Artillery fire also sought to keep the reinforcing German spotter pinned to limit the effectiveness of the reserve Nebelwerfer battery which as delayed reserves to the rear of Lingevres. 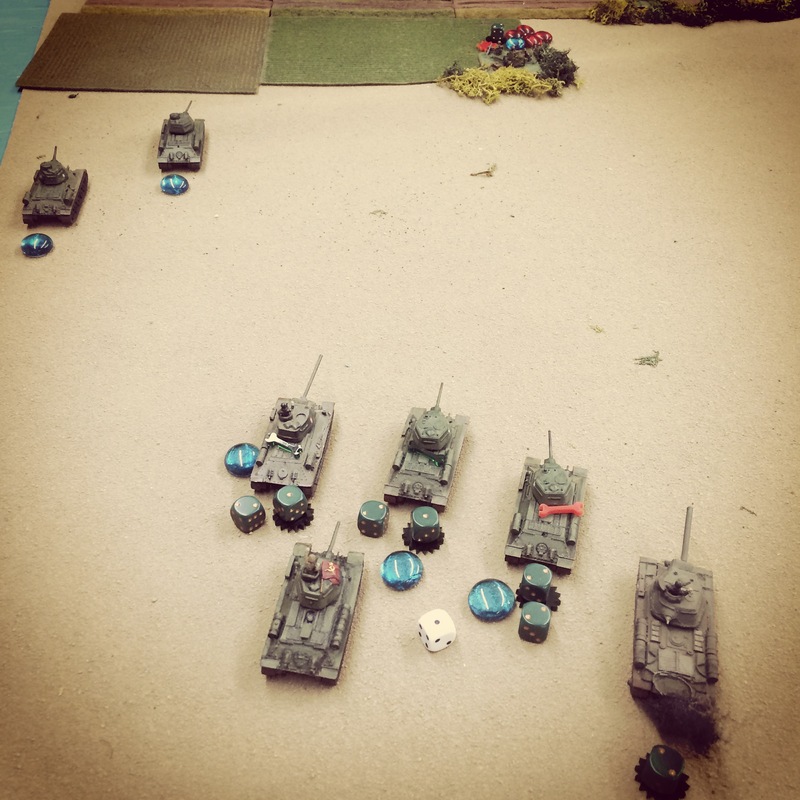 In the meantime, a multi-turn tank duel had settled in between a lone Firefly and Panther while a reinforcing Panzer IV platoon arrived at the edge of town. 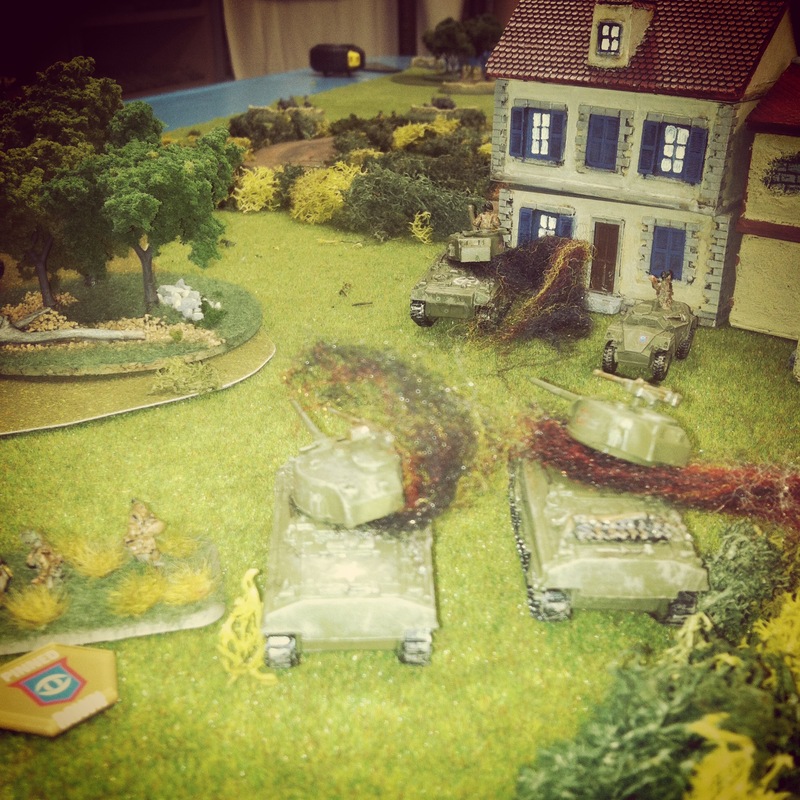 Both tank groups traded fire, and in the end, the Panzers were routed with two or their three destroyed and the Firefly fell to the Panther’s gun. Back at the farm field, Shermans traded fire with Pak 40s and destroyed an anti-aircraft platoon defending the town’s flank. 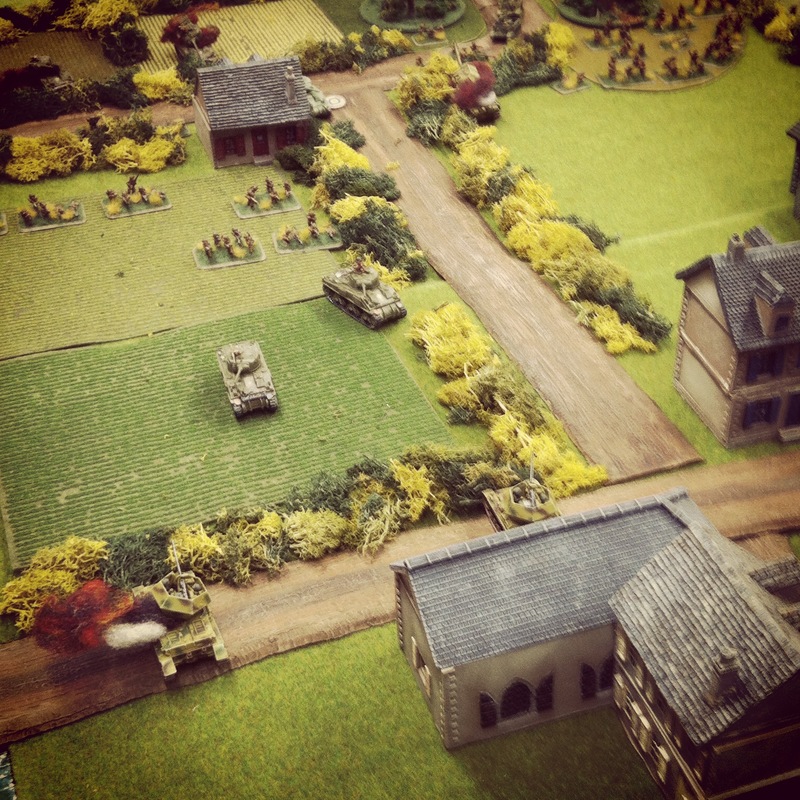 With two Panthers left on either side of the church, Shermans on each side of town and advancing British infantry, we called the game a draw. After more than 20 hours of gaming over two nights and days, I was pretty worn out, but the interest in the D-Day event had made the weekend well worth it. 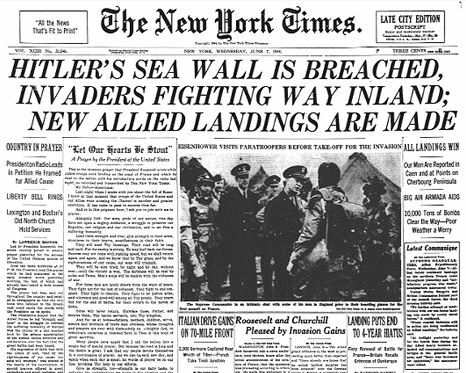 WWII still holds enormous interest to this day, as demonstrated not only by our weekend of gaming but by the mainstream media’s coverage of D-Day over the week leading up. In the next week, we’re kicking off an FOW Infantry Aces campaign with fresh forces hitting the tables in rounds of Italy-themed WWII games. 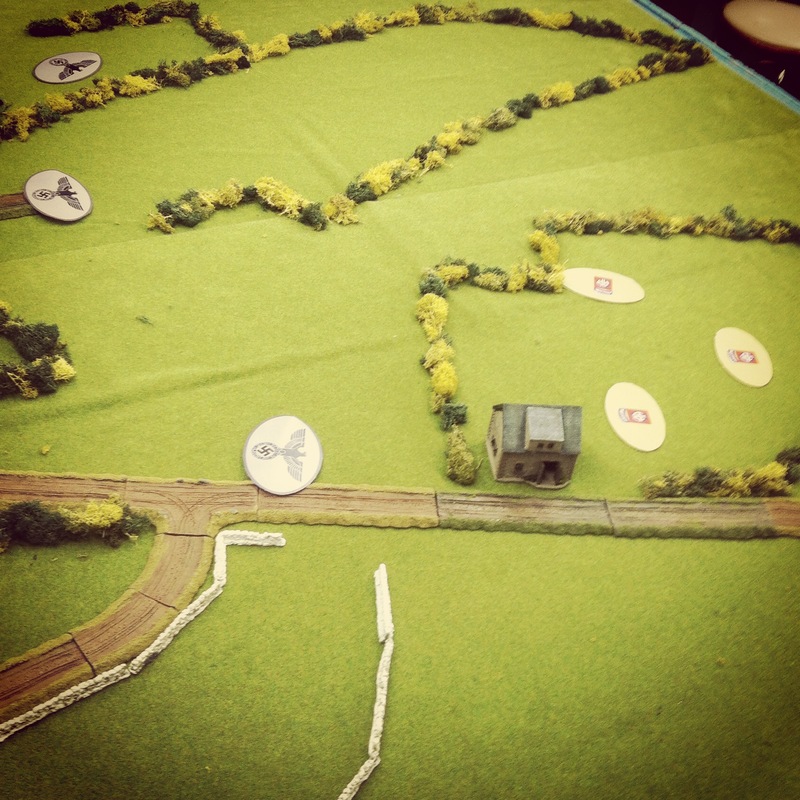 This fall we’ll be playing out some Market Garden battles and by the winter we hope to host some Battle of the Bulge engagements. It was a pretty special weekend in Brooklyn, but for regular visitors to Metropolitan Wargamers, there’s always the next game in this very unique New York City community. 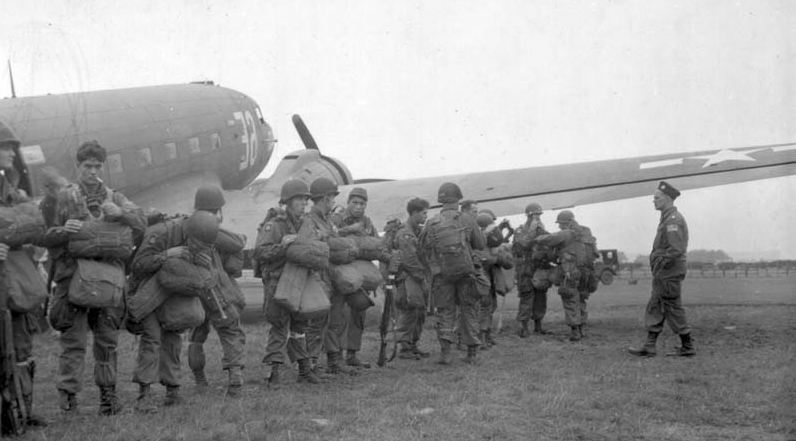 The ultimately unsuccessful week-long Operation Market Garden commenced on September 17, 1944 with an Allied push toward Germany. The ground “Market” portion of the campaign saw the British Guards Armoured Division taking point on the push into the Low Countries. 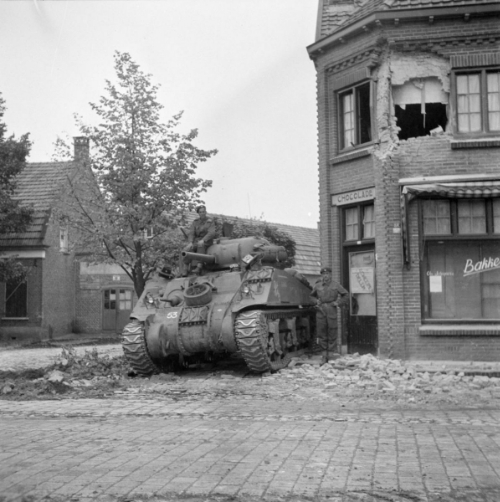 On the second day of the operation, a column of the Guards Armoured had rolled to the southern outskirts of Aalst, a Belgian town occupied by German forces since 1940. Led by Col. Joe Vandeleur, the division’s tanks encountered the remnants of German troops and guns which were dug in but heavily-damaged by the previous day’s Allied air bombings and artillery barrages. For the Germans, Aalst was a line in the sand protecting the Allied advance northeast to Antwerp and the Netherlands beyond. For the Allies, keeping the long column of armour moving was key to reinforcing the Allied airborne troops already engaged with German forces along several bridges. 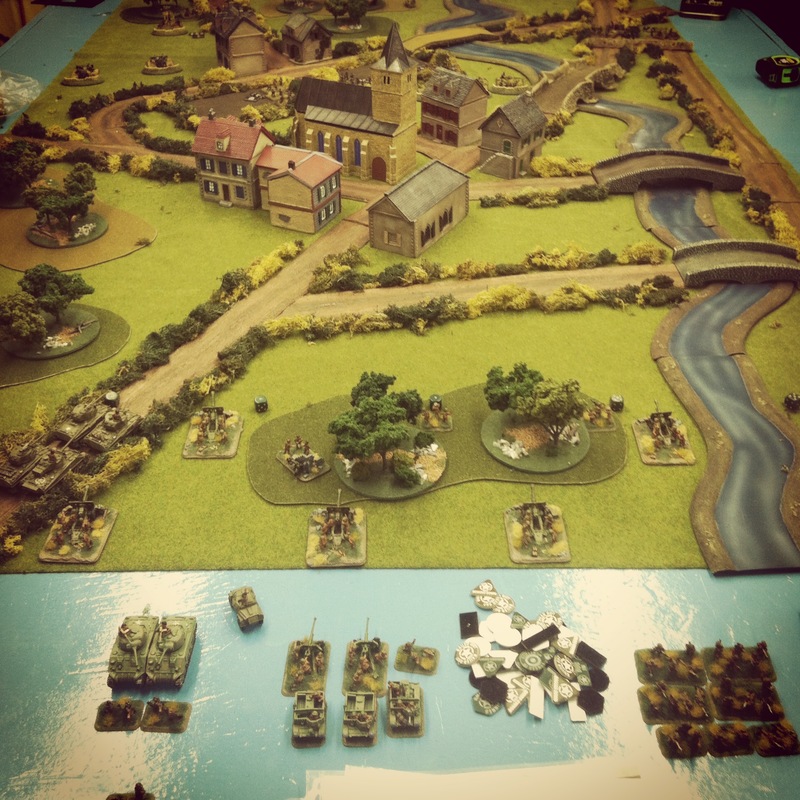 This past weekend at Metropolitan Wargamers in Brooklyn, NY we ran the Aalst scenario for Flames of War with 2000-point forces on either side of the table. We pulled our British and German lists from the Market Garden and Bridge By Bridge books. As a jumping off point for the game’s outline, we referenced an Aaalst scenario originally designed for Battlefront. 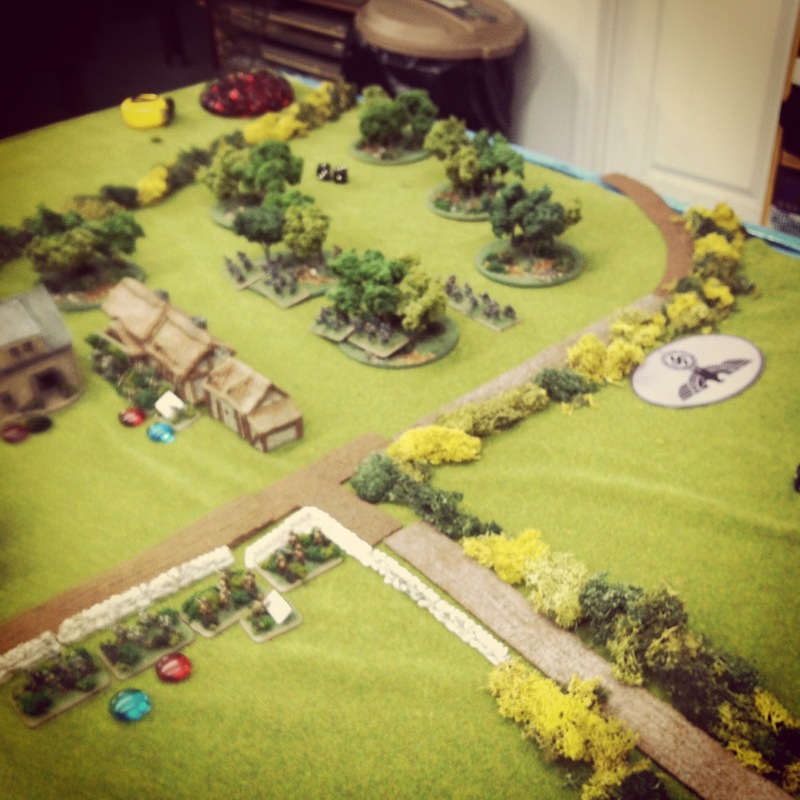 We planned a 10-turn game with points scored for destroyed platoons and an immediate end to the game when the British rolled a platoon off the German-defended north end of the table. As per the actual situation at Aalst in 1944, the Germans began setting up with half their force heavily dug in just north of the town’s center. Deadly 8.8 cm Flak guns were positioned on roads to their right and left flanks, and 7.5 cm PaK 40 anti-tank guns stood closer to town. 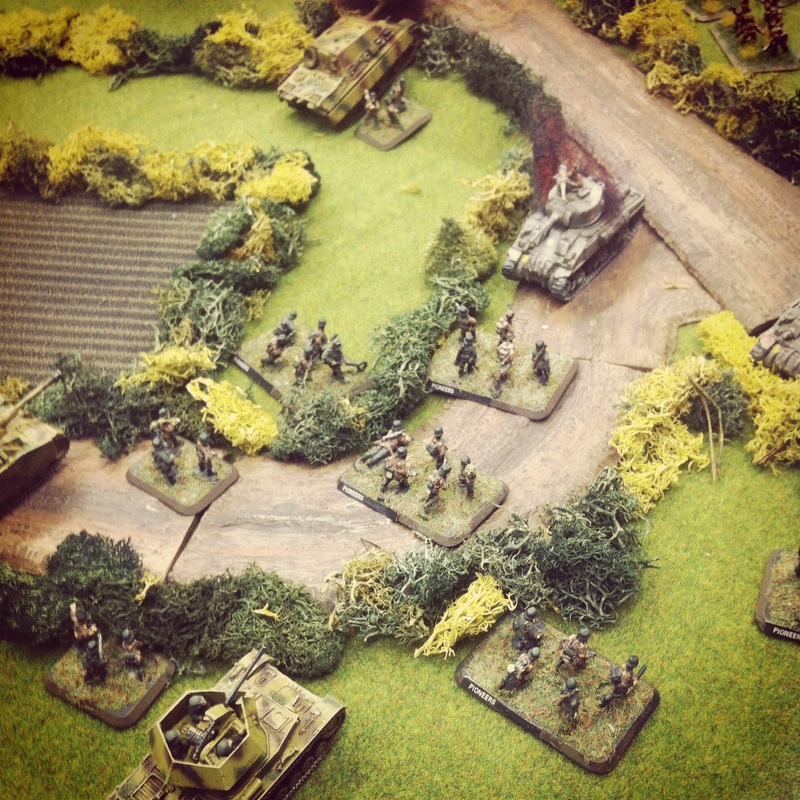 Infantry and heavy machine gun platoons hunkered down in the fields just outside of town, and a single Jagdpanther idled nearby. Expecting both ground and possible air forces, the German guns were well-prepared for the arriving British. The British laid out their 8-gun 25 pdr battery at the rear of the table and rolled on two platoons from the Guards with Joe Vandeleur attached. Spotters for the artillery were deployed in Shermans to the right and left hoping to provide eyes across the entire table for. Towed 6 pdr anti-tank guns, infantry, machine gunners and additional tanks lay in reserve off-table to follow the initial wave of armour. 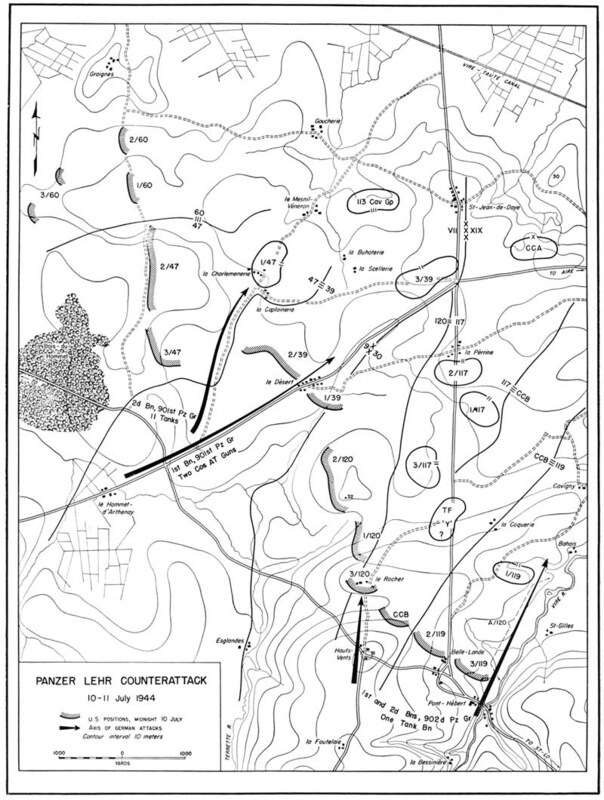 The plan was to use Vandeleur’s special rules to rush tanks to the center of the table, saturate the Germans with artillery fire and pave the way from additional supporting platoons. 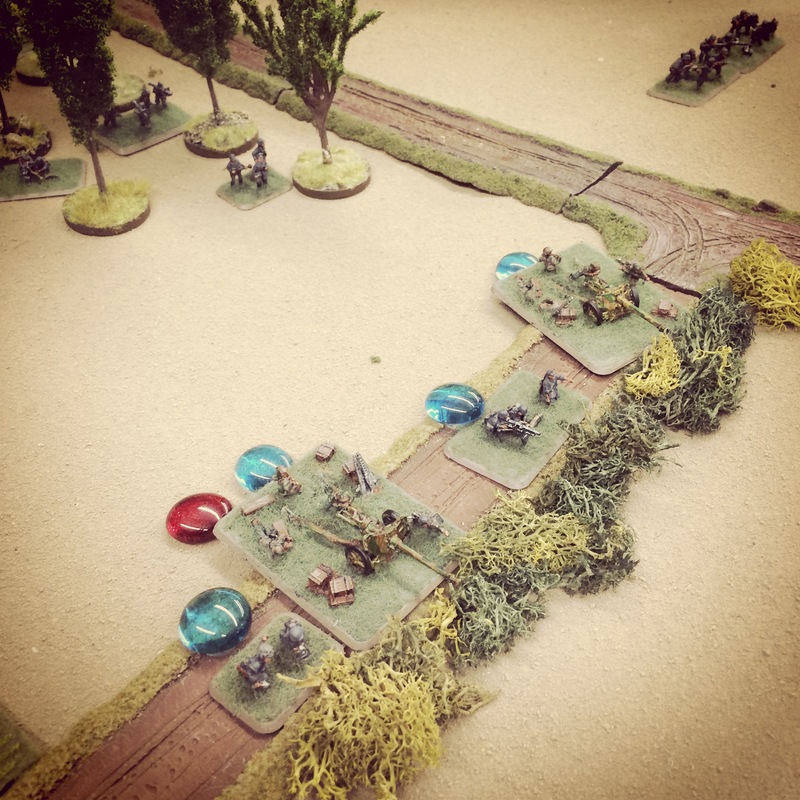 In the first two turns, the Guards quickly rolled up to take position behind the town to the south with their Vickers machine gun platoon riding on the tanks. 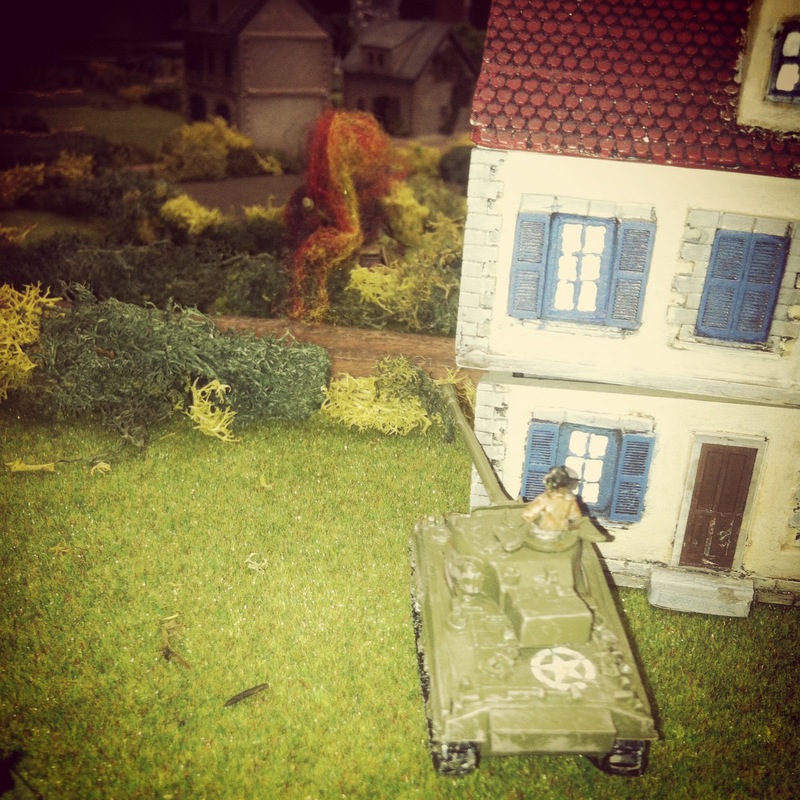 The British artillery spotter hopped from his Sherman tank and ran for back door of a building. 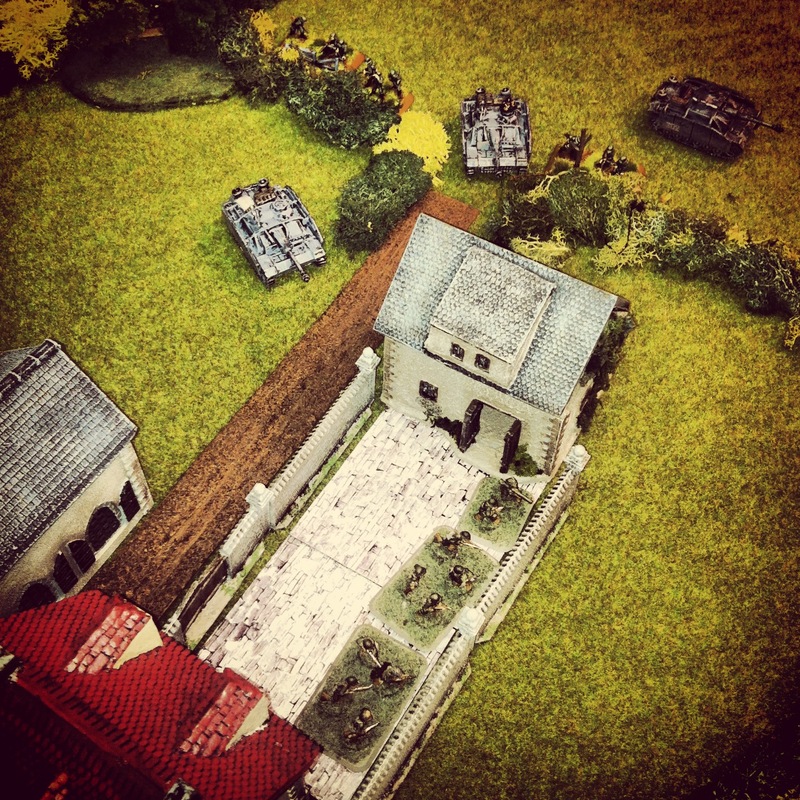 The Germans made way to the north of town with infantry looking to occupy the church at Aalst with a lone Jagdpanther in support. 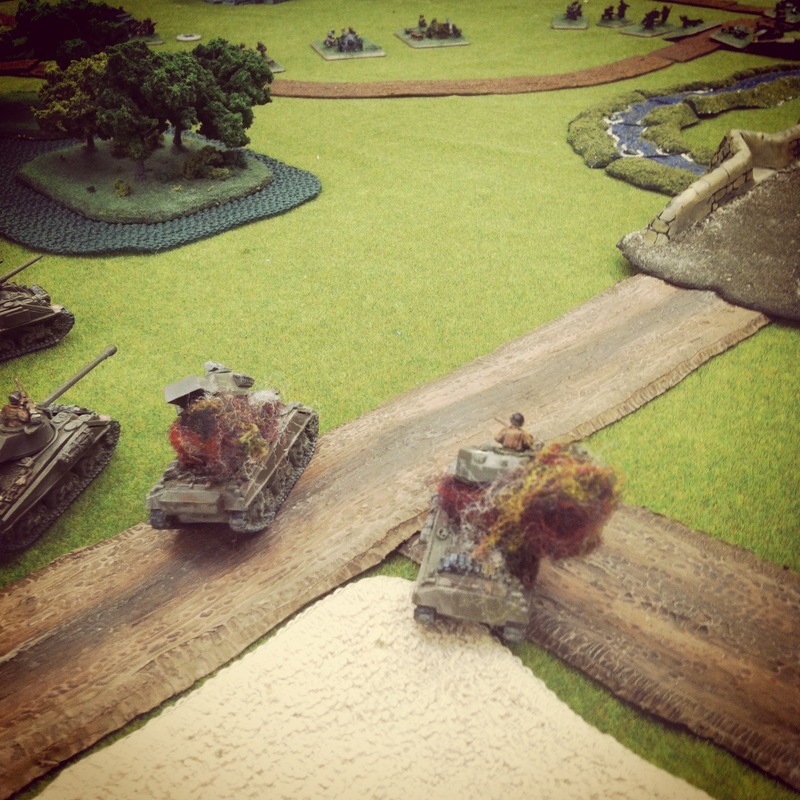 Fire opened up in the next two turns with a well-positioned Firefly scoring a kill on the nearing Jagdpanther. 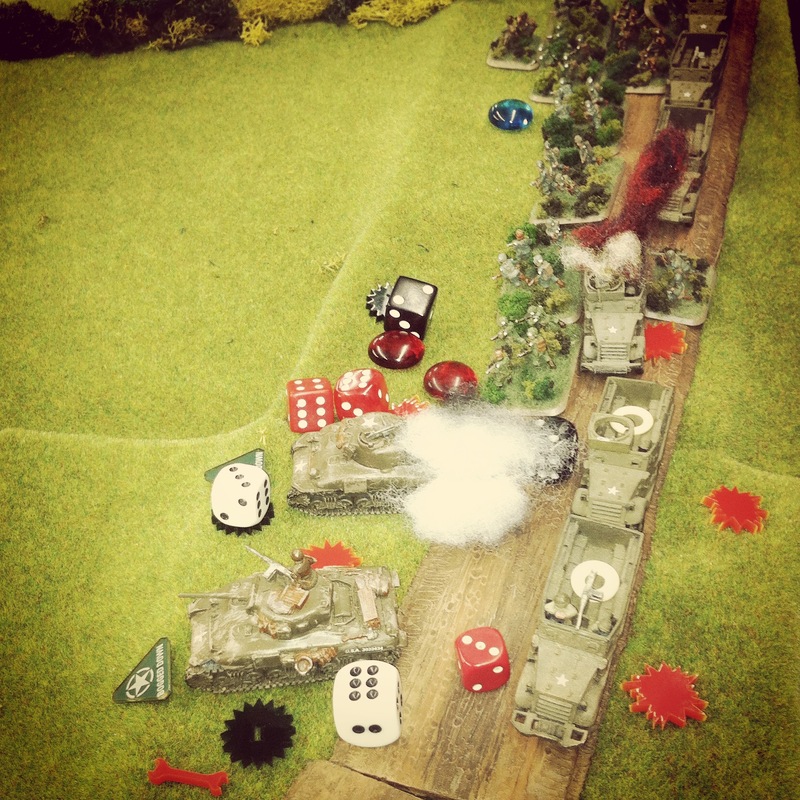 Returning fire, German 88s destroyed the Firefly and PaK 40s bailed and subsequently wrecked two other Shermans. Machine gunners made their saves, jumped off their tanks and made way for cover in a nearby building at the town’s intersection. Meanwhile, British artillery lobbed a volley over the town hoping to slow down the German infantry and machine guns looking to take hold of the town’s buildings. The barrage resulted in a destroyed PaK 40 just to the north of the church, but the German infantry pressed on to take up positions in the church. 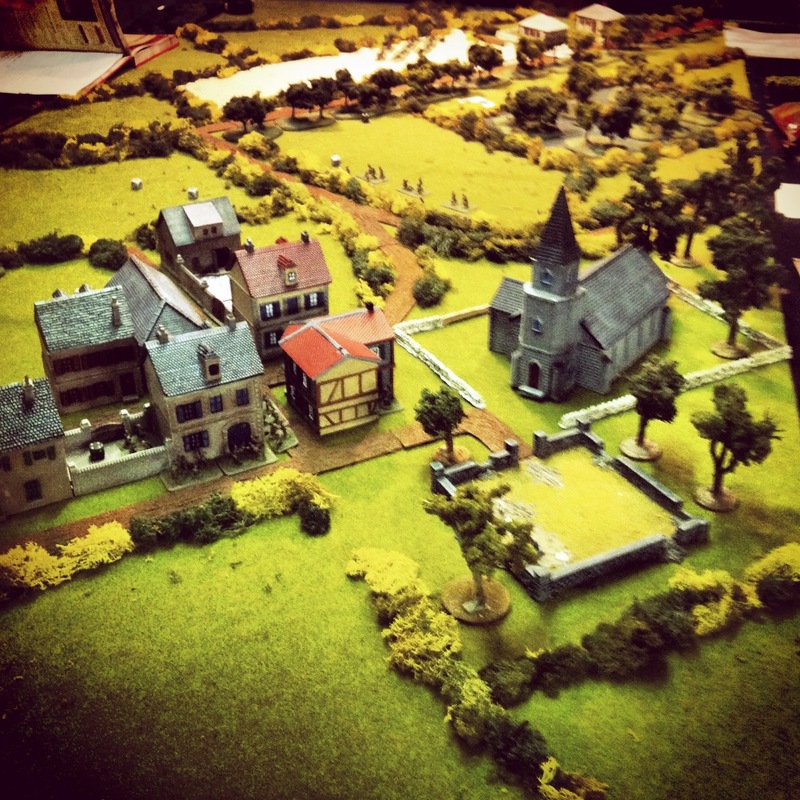 With British infantry reserves moved at the double to the town and then moved in a subsequent turn to assault the church. 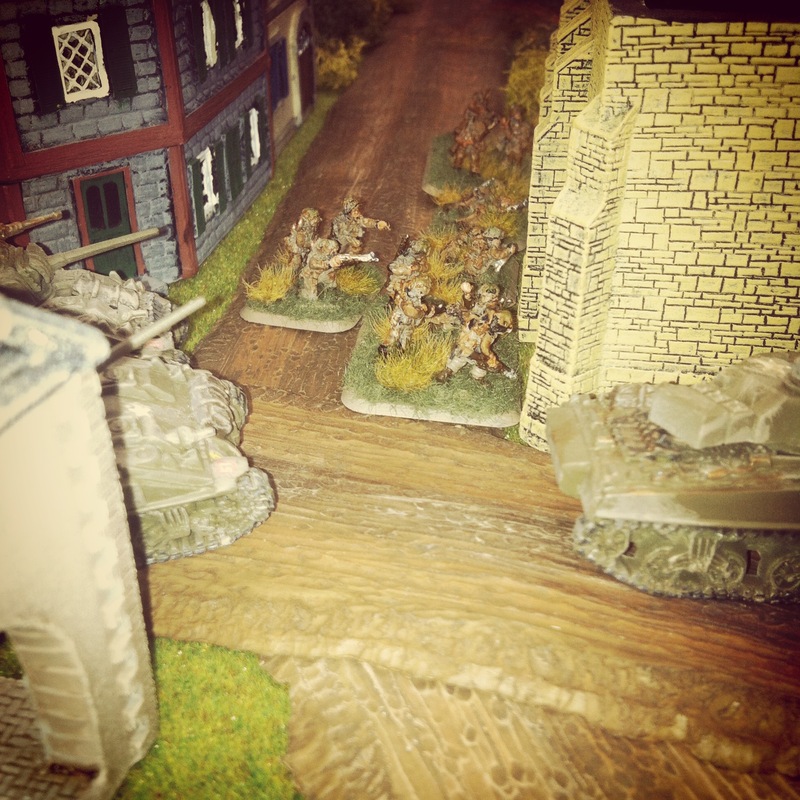 At the same time, a reinforcing Guards tank platoon raced to the town center. Shots from the Shermans failed to destroy nearby PaK 40s but fire from the Vickers guns in a nearby building pinned the Germans in the church ahead of the assault. 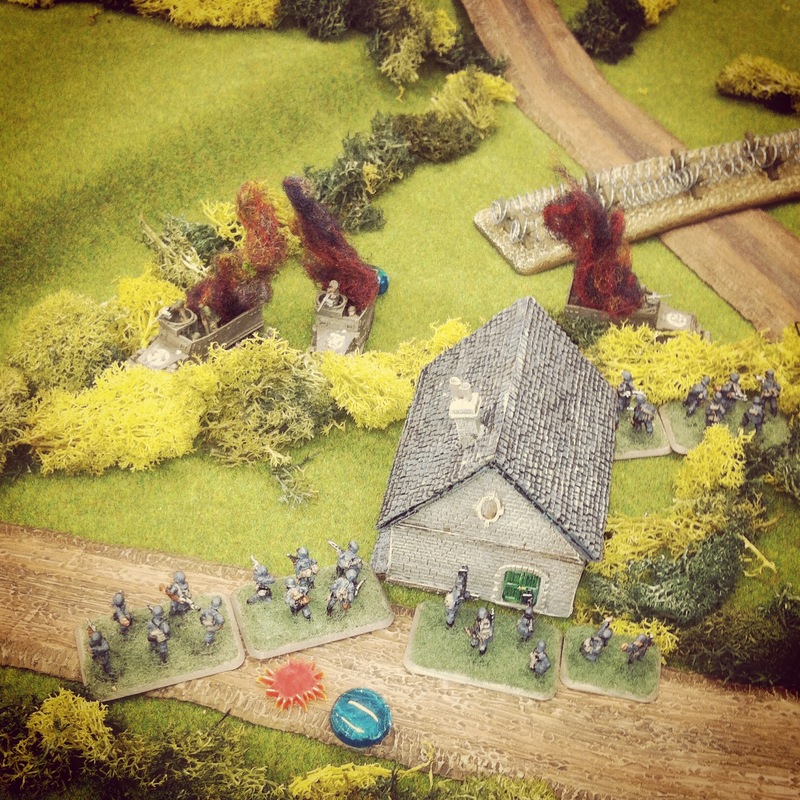 Despite all the British fire lighting up the center of town, the assault failed and the British infantry fell back to the other side of the street. 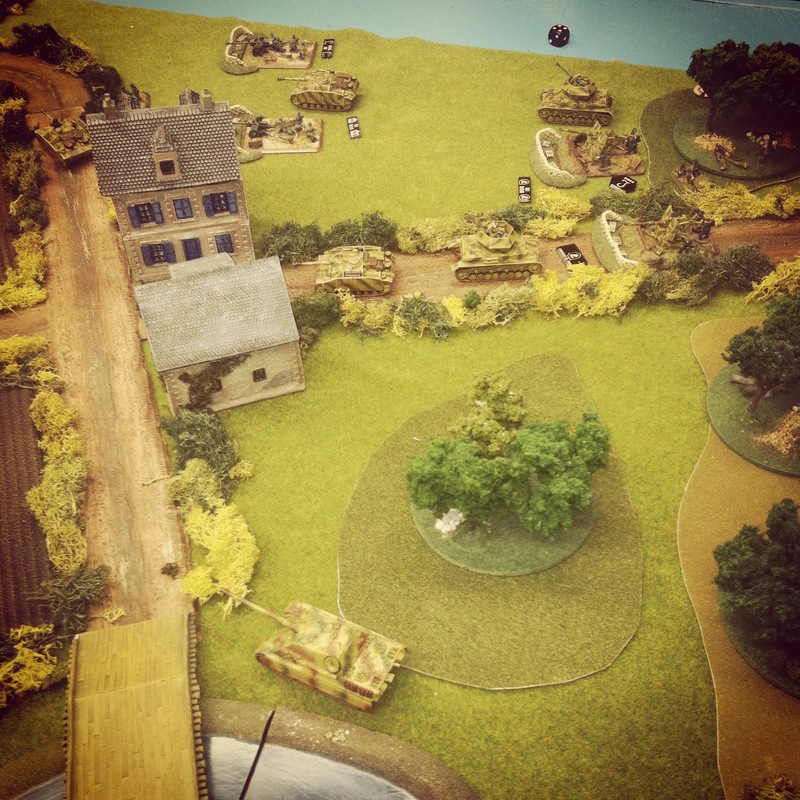 With the British stalled at the crossroads in Aalst, German reserves moved onto the table. 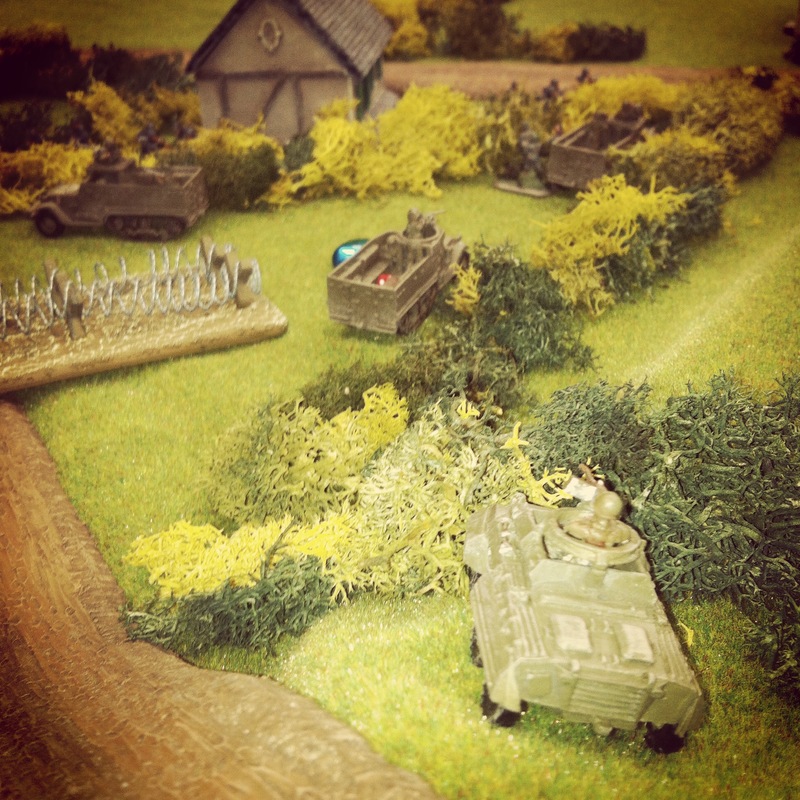 A Stug platoon, Wirbelwinds and a fresh Jagdpanther began closing in from the northwest of town, drawing fire from the British battery looking to slow their advance. Volleys from the 25-pound guns blew up an 88 and a PaK 40, but the mass of German hardware kept rolling forward. Hoping for a hard push of combined arms on the German right, British command tanks followed by two platoons of infantry pressed forward from a nearby woods. The British tankies proved to be tough, surviving a turn of fire from nearby Stugs and an attempted infantry assault with Panzerfaust-wielding infantry as British guns continued to range in and rain shells on the Germans to no effect. Back at the center of town, the last tank platoon took fire from the 88s, PaK 40s and a Panzerfaust in the church steeple and was destroyed. The one lone command tank on the western outskirts of town was surrounded and destroyed by combined tank and artillery fire. 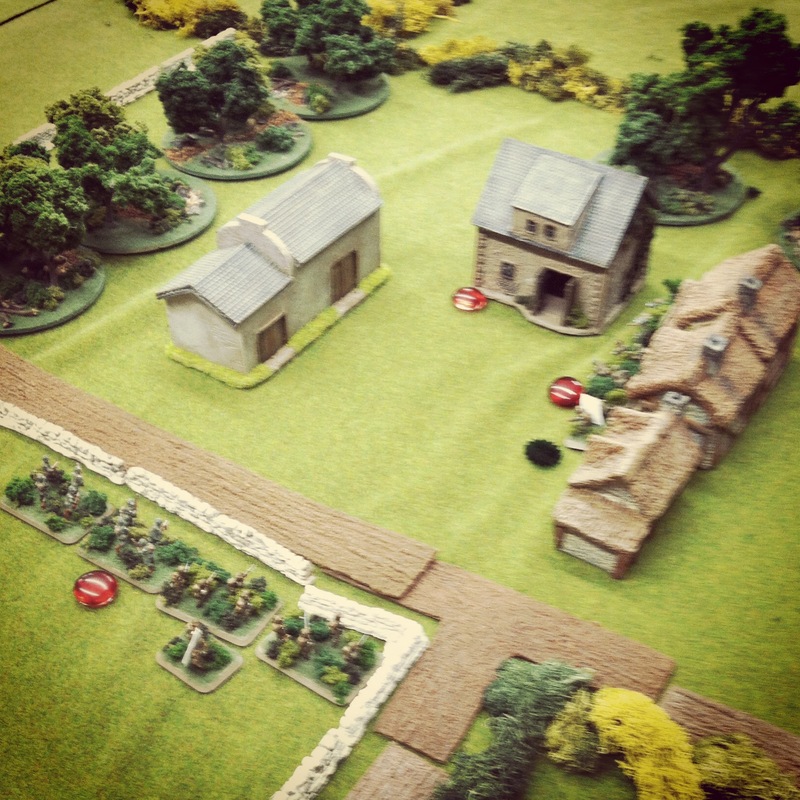 With only the remnants two rifle platoons and the Vickers left spread through the town, the game was lost for the British. As the sun set in the west, Aalst remained in Axis hands. In our discussion after, the British artillery had only been effective only about 50% of the time and only eliminated a few units throughout the game. Too many British tanks burned too quickly against overwhelming crossfire from German guns, and reinforcing British infantry could never make headway beyond Aalst’s crossroads. 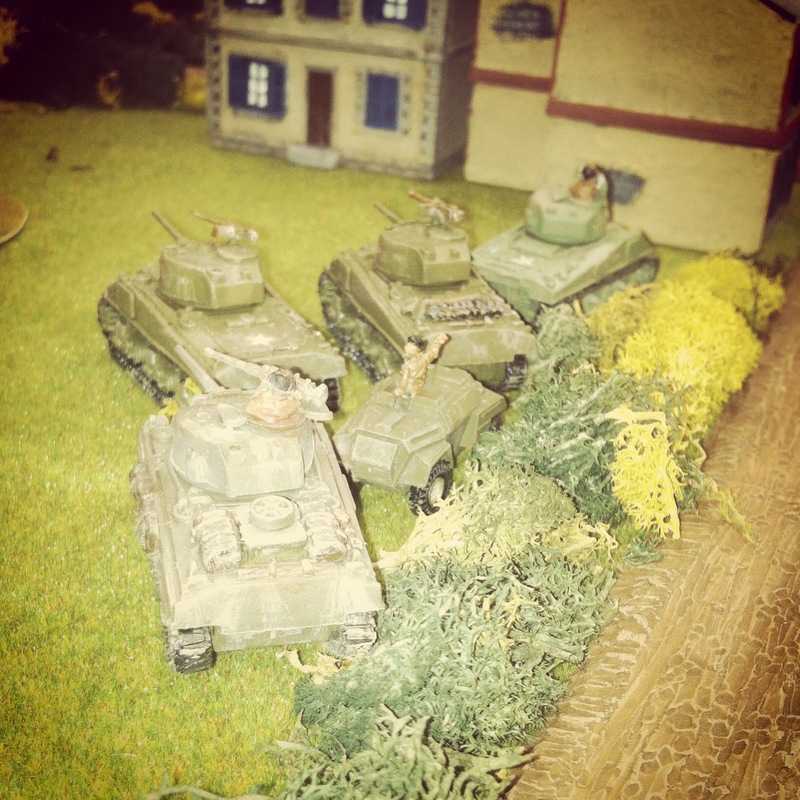 More British tank platoons with Fireflies might have gone a long way toward at least pushing through the town. Fortunately for the people of Aalst, the engagement during Market Garden resulted in the liberation of the town by the British. 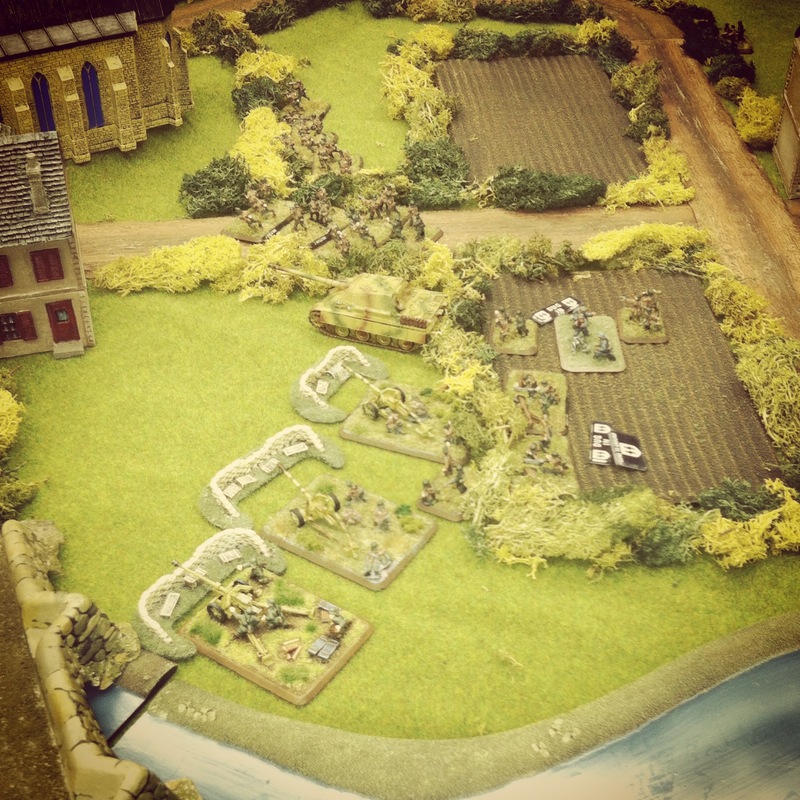 Pictures from the victory show a very different outcome from our game with smiling faces all around. 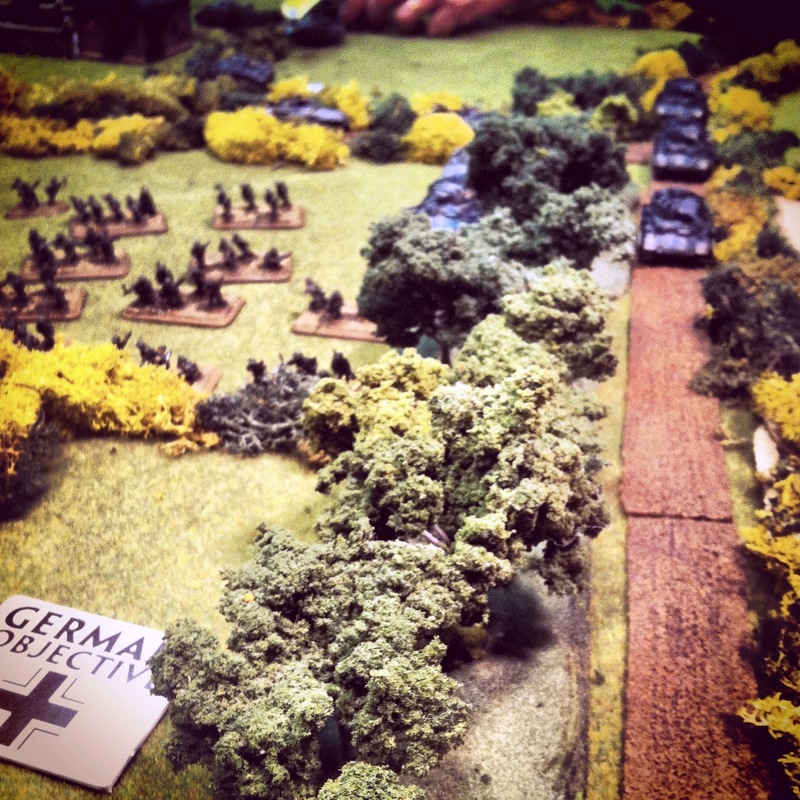 The very nature of wargaming sometimes just makes things go a different way, and this past weekend the dice rolled against the tide of history with a victory for the Germans at Aaalst.